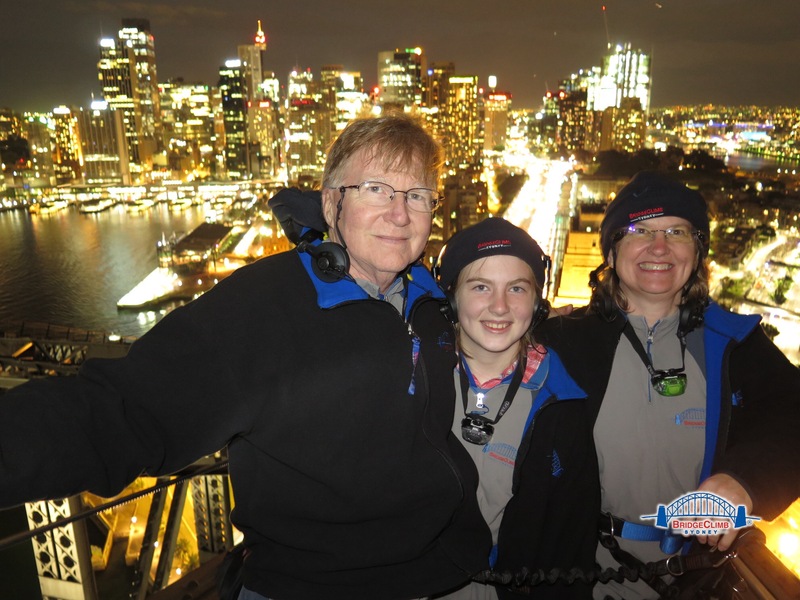 Australia 2016 Part 15 and FINAL: Finishing Strong! Good news! We felt good enough to get back on track today. The only good thing you can say about a gastro bug is that it usually leaves as quickly as it comes. It tears through you, leaving some temporary wreckage, and is on its merry way to humiliate someone else. 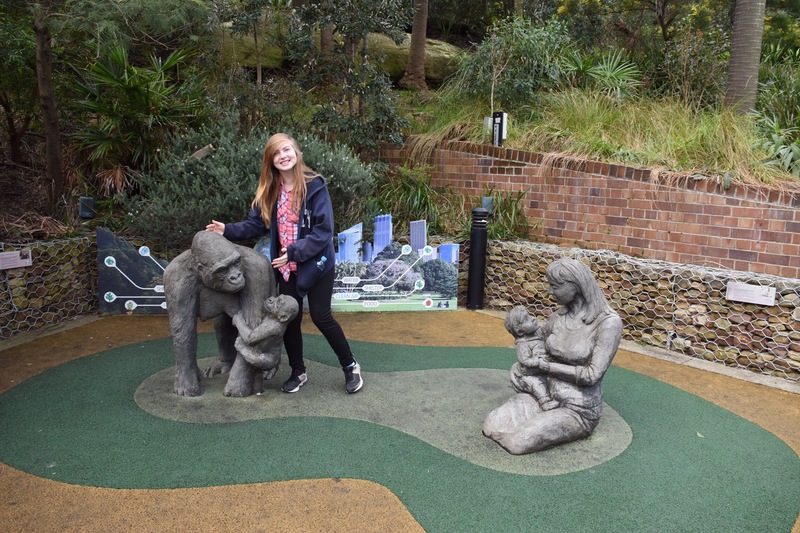 We had scheduled the Wild Australia Experience at the Toronga Zoo. It would be our last morning to bask in the joys of a leisurely, all-you-can-eat breakfast at Pier One, and we took full advantage. Genene is learning to drink entire pots of tea, while Greg and I drink the long blacks with cream. We took an Uber to the zoo so that we could get dropped at the main entrance to get our tickets and meet our guide. 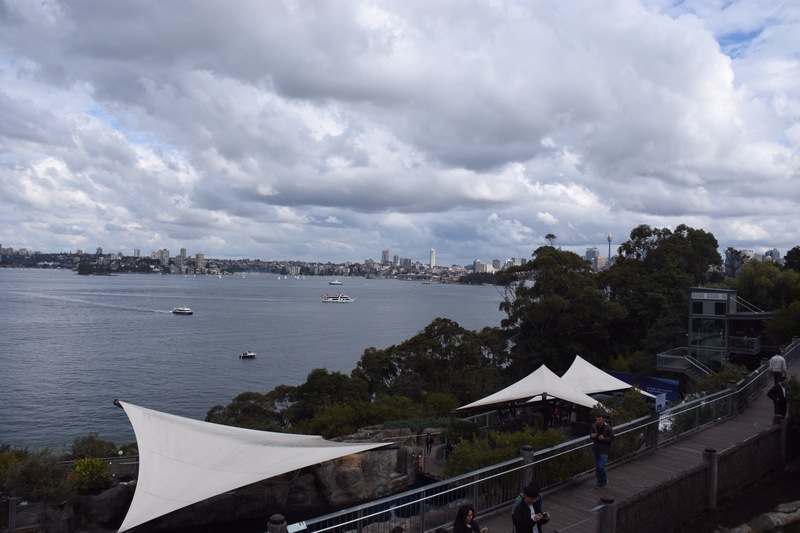 The zoo is set in the side of a steep hill, and if you arrive by ferry, you are at the bottom. If you already have your zoo tickets (which we didn’t), you can ride a cable car to the top. Otherwise you have to load up on the city bus. We have made enough transfers! We just caught the Uber and got dropped off right at the front door. Keep your hand flat, Genene! Shawn taught us a little about the life cycle of the kangaroo. They are very prolific breeders. 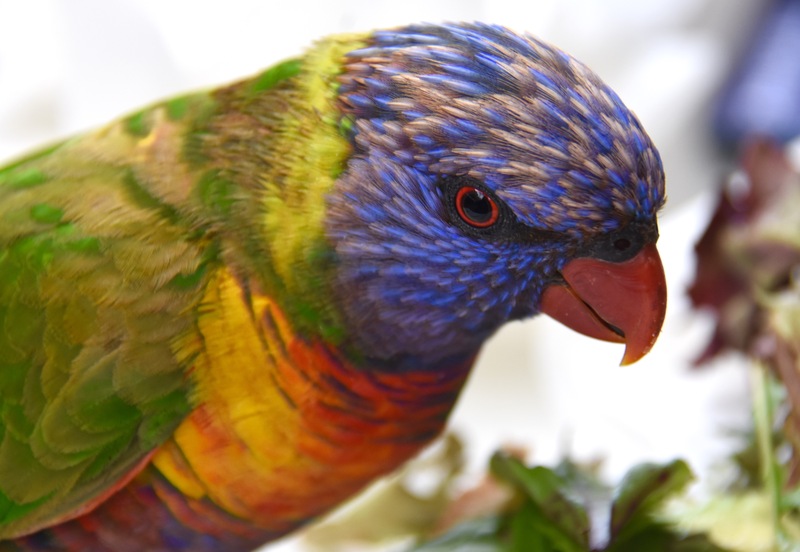 Far from endangered, they are well adapted and can be found all over Australia. The new baby is the size of a bean and is blind and hairless. As soon as it is born, it crawls through its mom’s fur and into her pouch to grow, where it will stay for about 190 days. After that time it will emerge from the pouch and hang around its Mama until it can fend for itself. 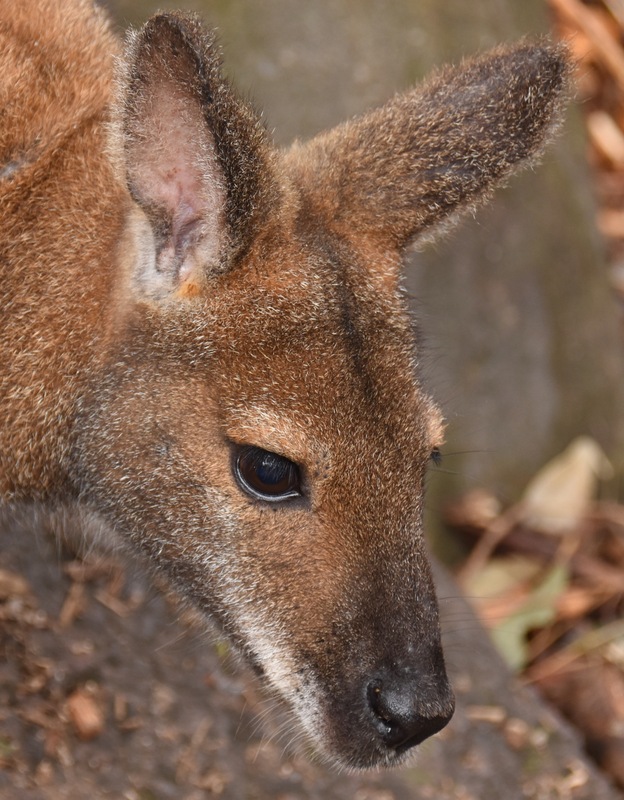 As soon as a baby is born, Mama Kangaroo can immediately become pregnant again. That means she can have one baby at her side, one in her pouch and one in her womb. In times of drought or other distress, Mama can essentially push the pause button on her pregnancy for several months. 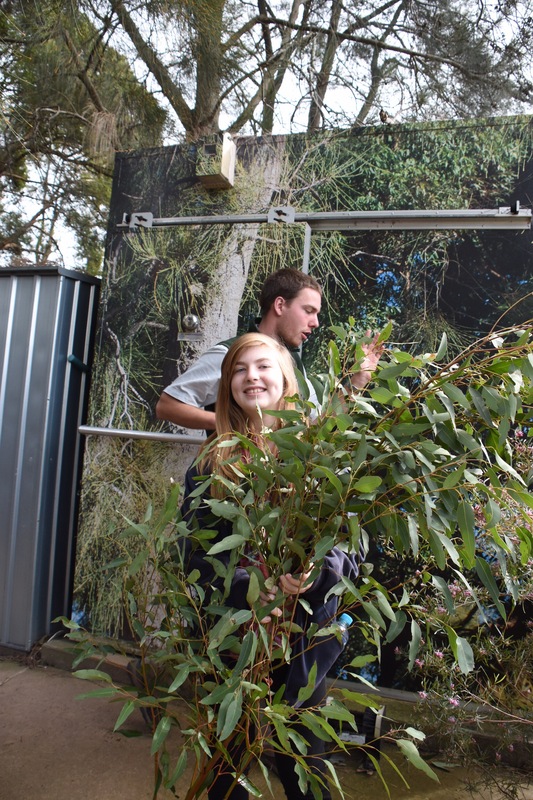 Our next stop did not involve animals at all: we went to a refrigerator unit filled with eucalyptus leaves. We were going to get to feed the koalas! 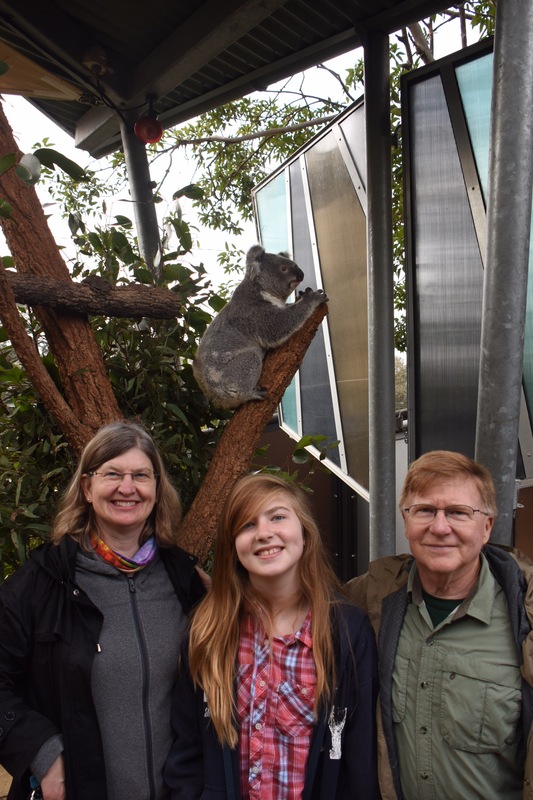 Shawn explained that each koala in the zoo gets 1,000 eucalyptus trees dedicated to it at a nearby plantation. The freshly cut limbs are shipped in daily, and the leaves are offered to them. 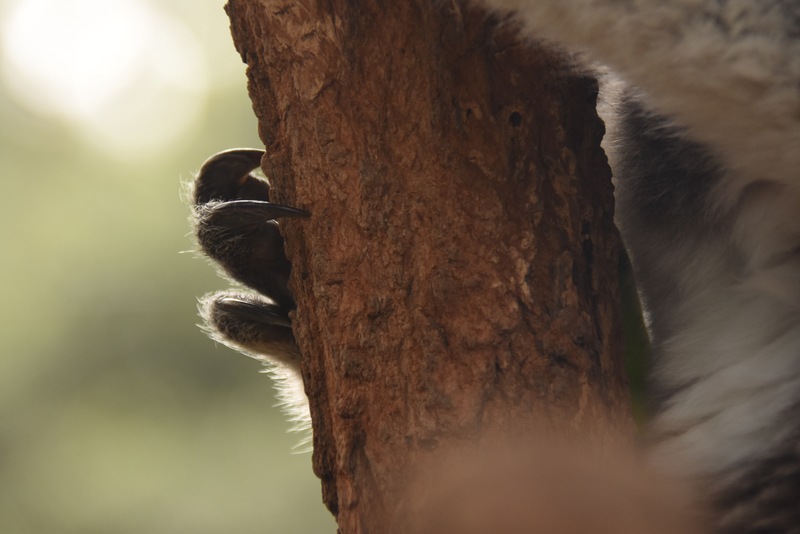 If the koala does not eat the branches on the first day, the zoo offers those branches to them one more day. If they aren’t eaten on the second day, the zoo knows the koalas will never eat it, and the zookeepers feed them to less persnickety creatures. 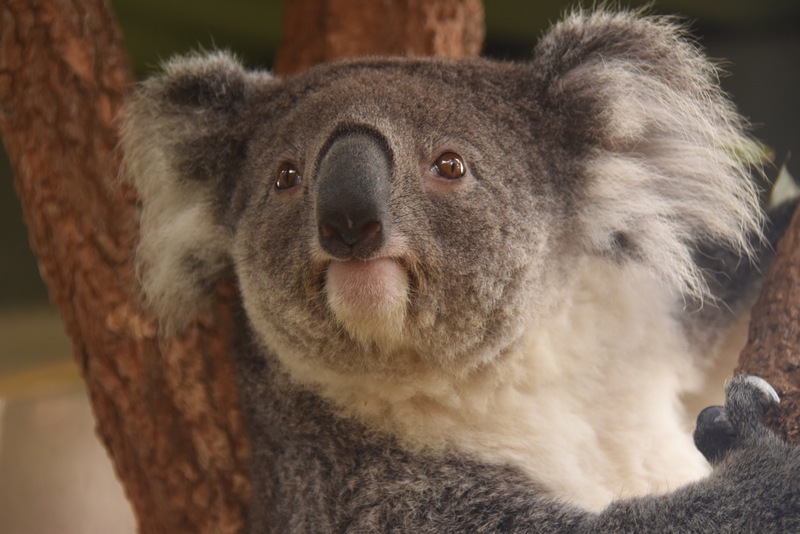 The koala spends 20 hours a day sleeping, and the rest of the time it eats, pees and poops. We had already discovered that on Kangaroo Island. 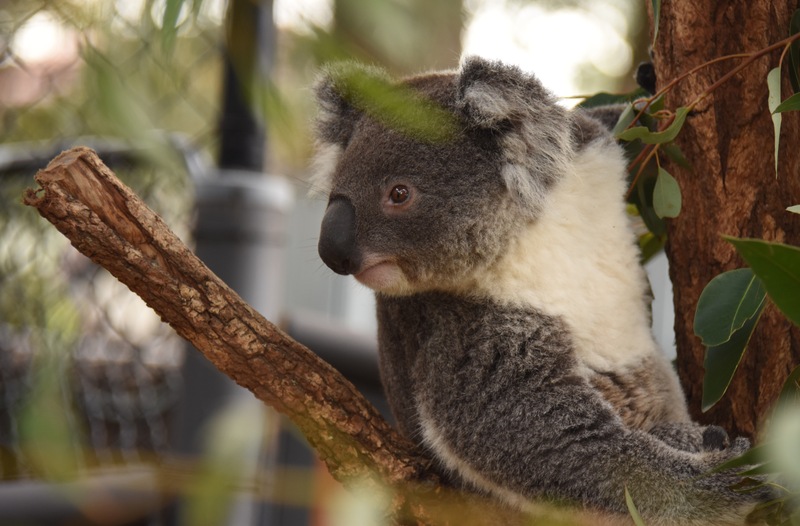 We were able to get a much closer look at the zoo koalas than their wild counterparts who stayed high in the trees on Kangaroo Island. 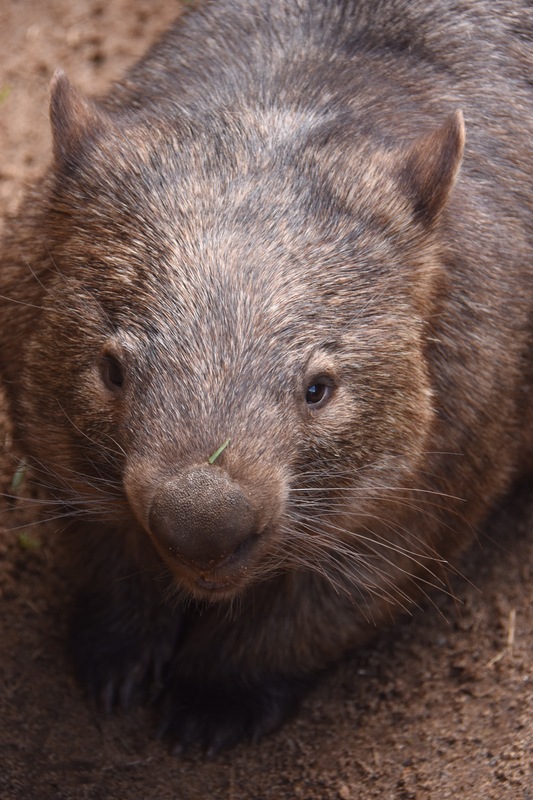 Next , we got to meet Lucy Liu the Wombat. 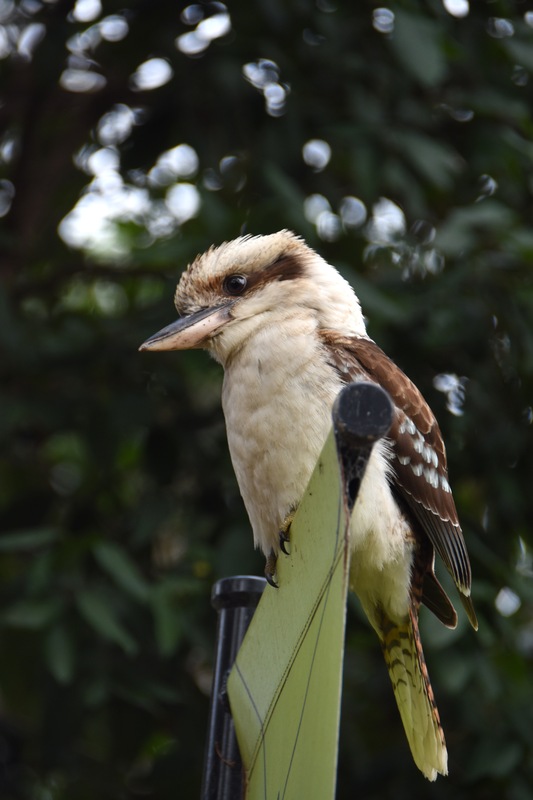 Throughout the zoo, we saw kookaburro in the trees. 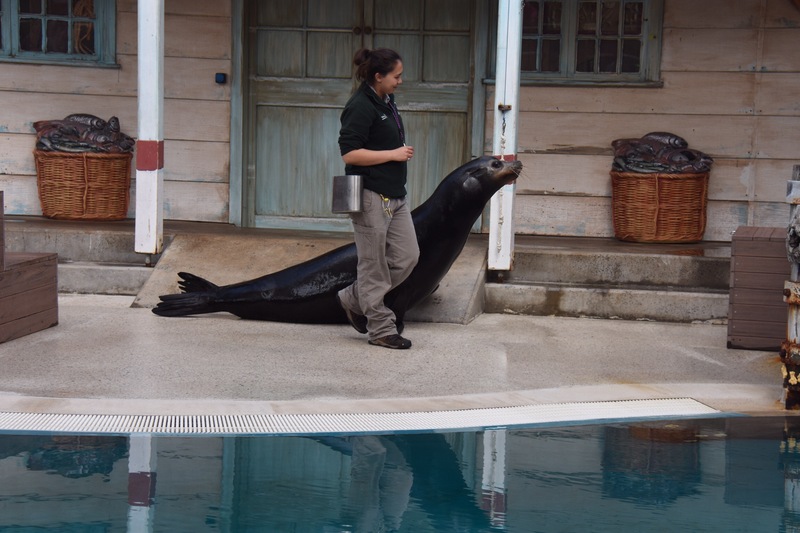 Shawn explained that they work as a team to steal lunches from unsuspecting zoo patrons. One flies down close as a decoy. While you are shooing it away, the second one swoops in for the steal. Isn’t that cunning? 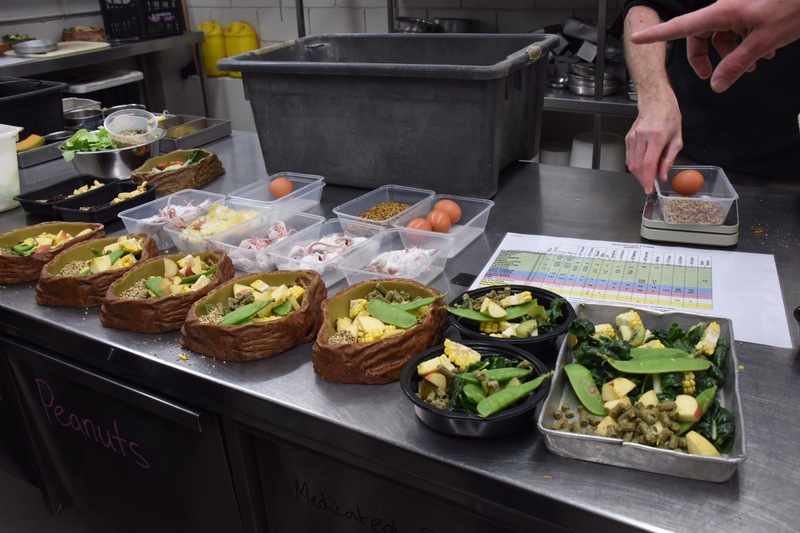 Our next stop was the zoo kitchen where all of the animal meals are prepared. 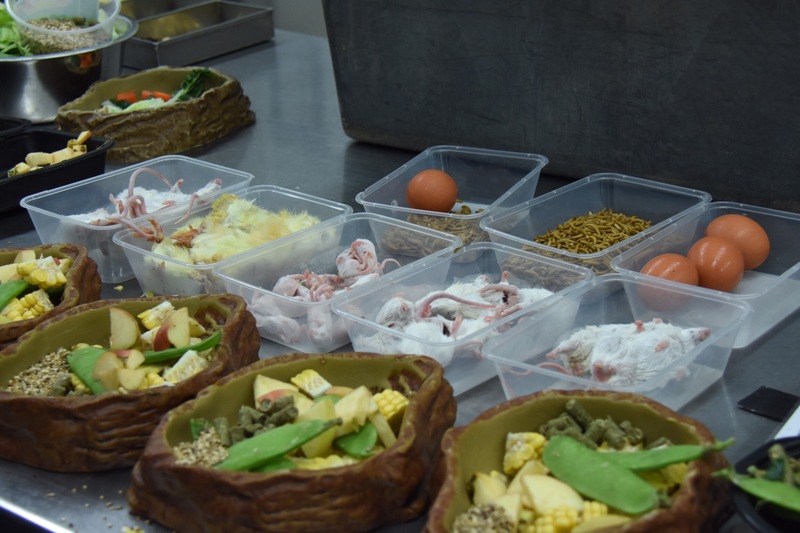 Shawn explained that their zoo uses food which is fit for human consumption. Nothing but the best for Toronga animals! The zoo has ethical rules about how animal life is handled if it is to become food. Invertebrates can be fed alive because they do not feel pain. All of the vertebrates (including small mice) are humanely killed before being fed. 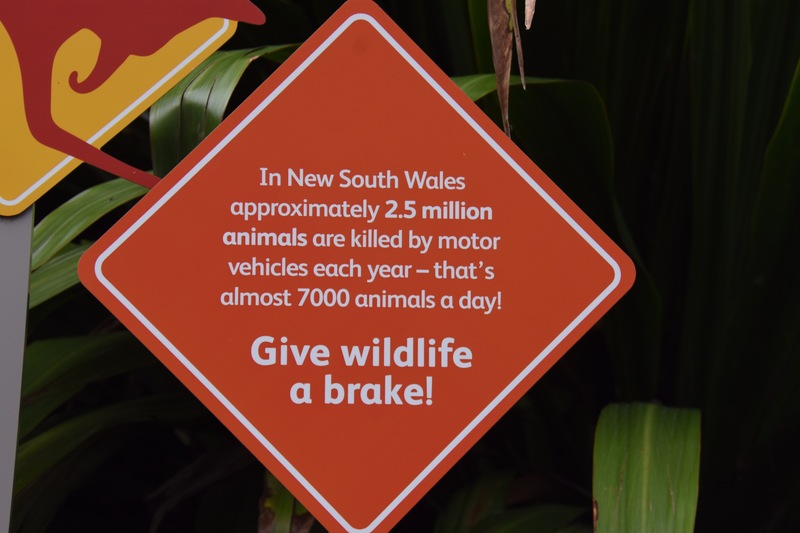 Nature is not as kind as Taronga. Yum, yum! White mice. My favorite! Our guide asked for a volunteer from each group. Of course, we volunteered Genene each time. Another perk of being an only child! 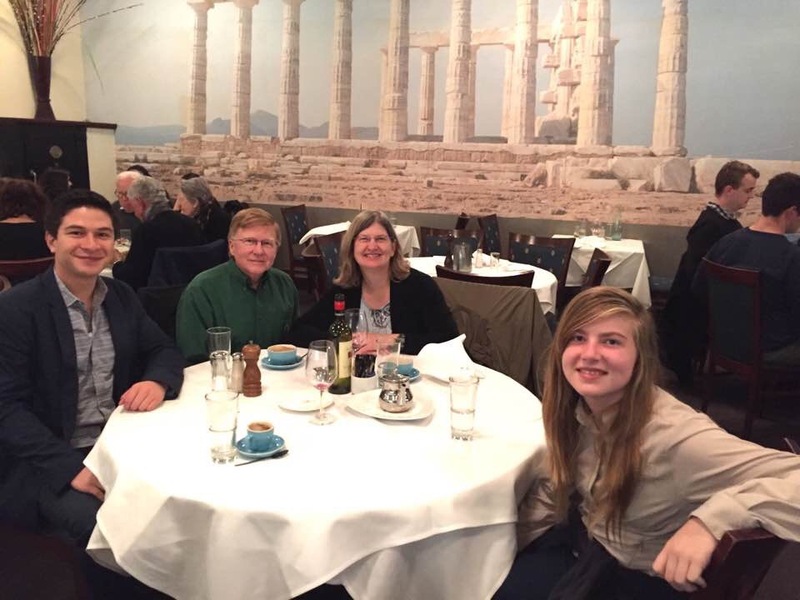 The London group volunteered their older son. Shawn told them both to close their eyes and hold out their hands. Shawn got something from the refrigerator and poured it into their hands. Their eyes flew open immediately and a millisecond later they dropped the stuff in their hands to the floor. He had given them a handful of meal worms! Then he delivered the worse news: everyone who didn’t volunteer had to taste one! They were alive and squirming gently. 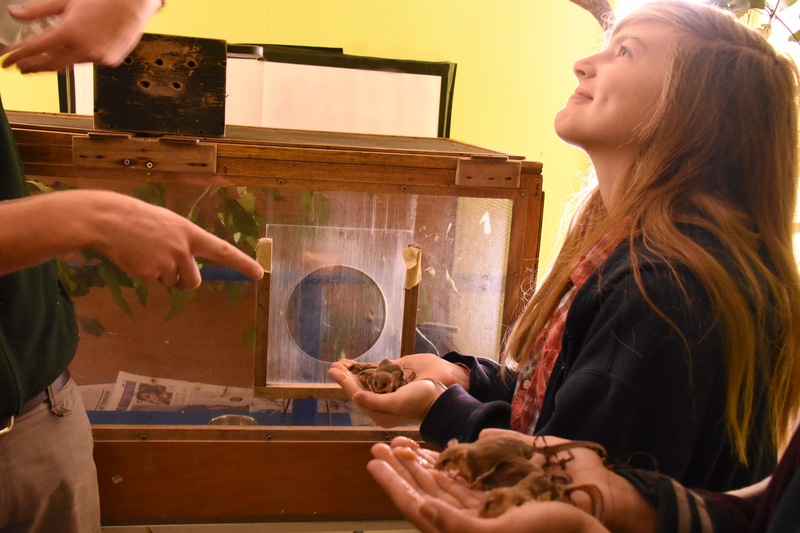 They were about a half-inch long and looked a bit like a tan-colored worm. I popped it into my mount and quickly chewed so that it would STOP MOVING! It was slightly nutty tasting to me. Greg thought it was like salted celery. Anyway, it wasn’t bad. If I were caught in the desert, I could make a meal on them. Everyone in the group tried one, including Genene. I told you this was a good crew! Shawn told us we were going to get to feed another uniquely Australian animal, the greater bilby. He grabbed a container full of the meal worms and we headed into a darkened room. He opened the door to their habitat, and the little creatures ran out into the hallway toward us, took one look at us, and ran back into their room. We had to go to them to feed. They looked like something between a possum and a rat. They scampered quickly in their habitat, stopping to snag a few worms and run back into their holes. 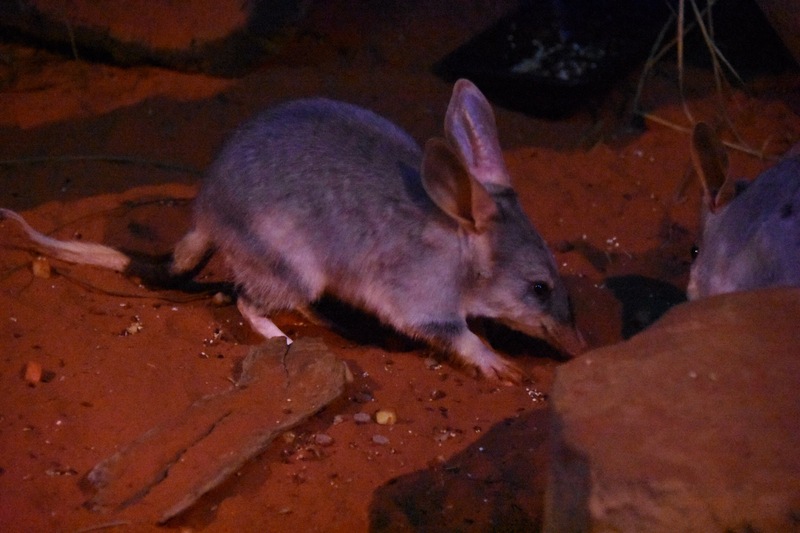 The lesser bilby actually became extinct in the 1950s, and the greater bilby is endangered. Their population has been decimated by feral cats and foxes. The country has responded by raising awareness of them. Conservation efforts are underway, and the Australians have replaced the Easter Bunny with the Easter Bilby. That reminds me: there is another reason to hate the Easter Bunny Down Under. Rabbits were not a native species to the continent but were introduced by an Englishman in 1859. Much like the story we heard about the cane frog, the rabbits soon overran the landscape, devouring the food needed by native animals. Several native species were driven to extinction, and sheep farmers saw their grazing fields being decimated by the rabbits. The government undertook the construction of large “rabbit-proof fences” to contain the spread of the creatures. (By the way, there is an excellent movie called “The Rabbit-Proof Fence.” It’s about an aboriginal girl who is trying to get back home after basically being kidnapped and conscripted for menial work by the Australian government. Check it out on Netflix.). Back to the rabbits. It took scientists some time to find the cure: they introduced a virus to kill the rabbits. Their numbers have been greatly reduced, but those rabbits that survived were resistant to the virus. Rabbits have still not been eradicated. Human beings sure do create a lot of problems when we move species out of their natural habitat. The poor Englishman probably just wanted to be reminded of home when he turned those first rabbits loose in his backyard. Anyway, back to the zoo. After we finished feeding the worms to the bilbies, Shawn took us back to the kitchen and had us sniff a thick liquid they had concocted. It smelled a bit like molasses to me. He grabbed a small cup and we followed him back to the darkened animal area again. 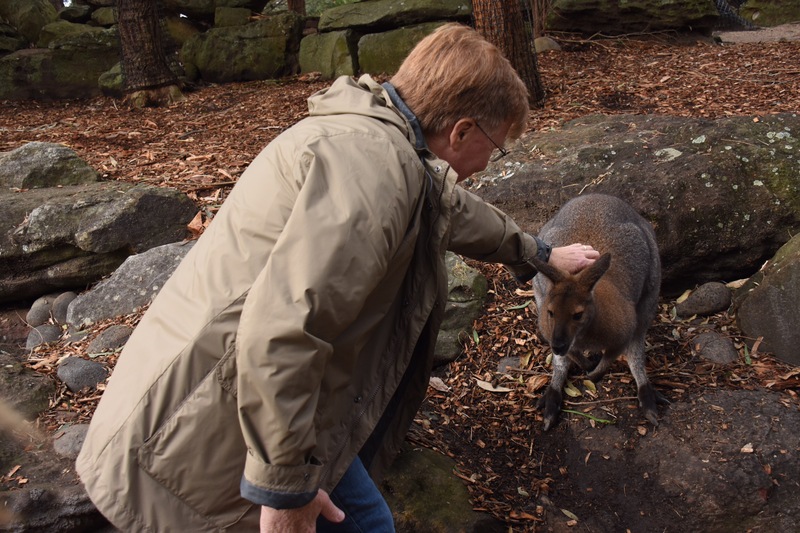 He asked for two volunteers, and Genene and the young UK kangaroo boxer stepped up. 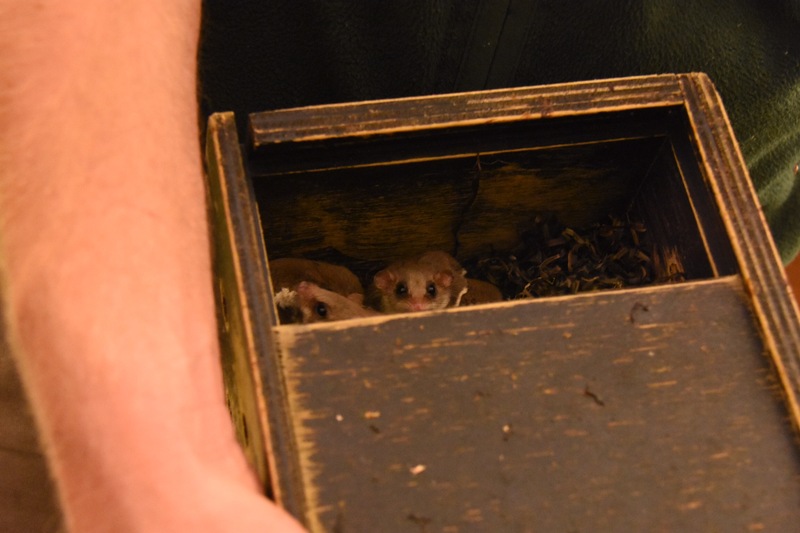 Shawn smeared some of the molasses on their hands and opened a small box, about the size of a shoe box. 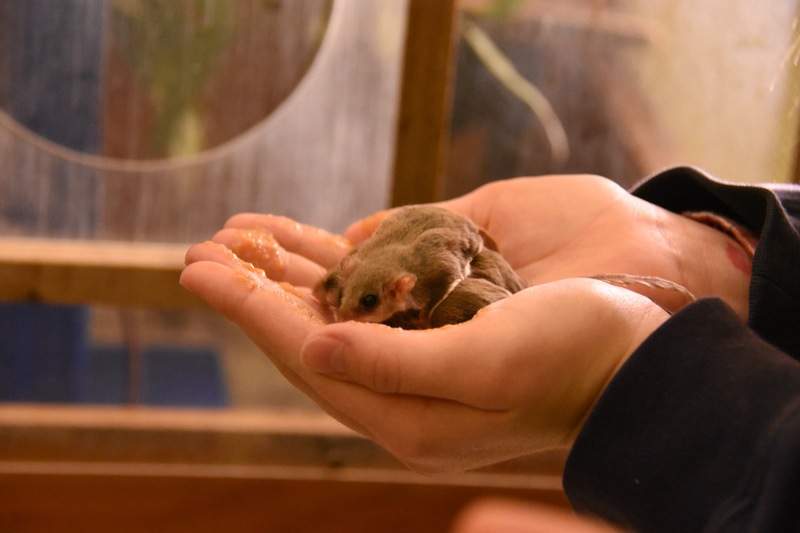 He pulled out six feathertailed gliders, also known as pygmy gliding possums. They are the smallest gliding mammal, about the size of a mouse. He put three of them on each of the kids’ hands and let them start eating the molasses right off their fingers and palms. Things were going swimmingly, and Shawn decided to let everyone feed one. He spread the sweet concoction on our hands and redistributed the little creatures. Everyone was having fun until one of the gliders took a quick crawl up Kanga Boxer’s arm. He shrieked like a little girl and clamped down. I was afraid that he had mashed the little creature, and Shawn couldn’t find it for a while. Furthermore, Kanga Boxer’s blood-curdling scream was on a frequency that activated the other gliders, because they all started wiggling and Greg’s glider started heading up his arm. Thankfully Greg didn’t scream like a girl! Finally Shawn located the missing glider. I think it was somewhere around Kanga Boxer’s neck under his hoodie. His mom had to laugh. She said that her son had that effect on every animal. She said he could go to any neighbor’s house and be told, “Oh don’t worry, our dog is friendly!” Moments later, he will be bitten. 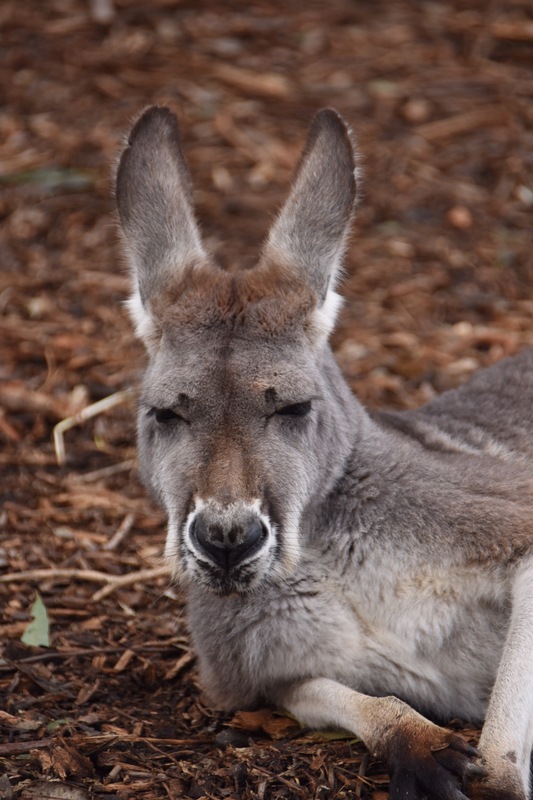 I don’t think Kanga Boxer will become a zookeeper. I did admire his good nature though. He literally rolled with the punches. 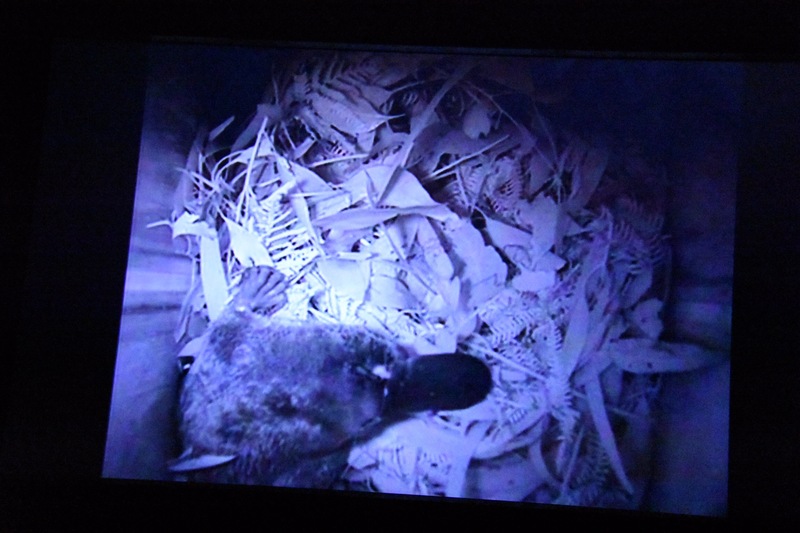 As we were putting the gliders away, Shawn got a radio transmission: “The platypus is in the tank!” Off we went. 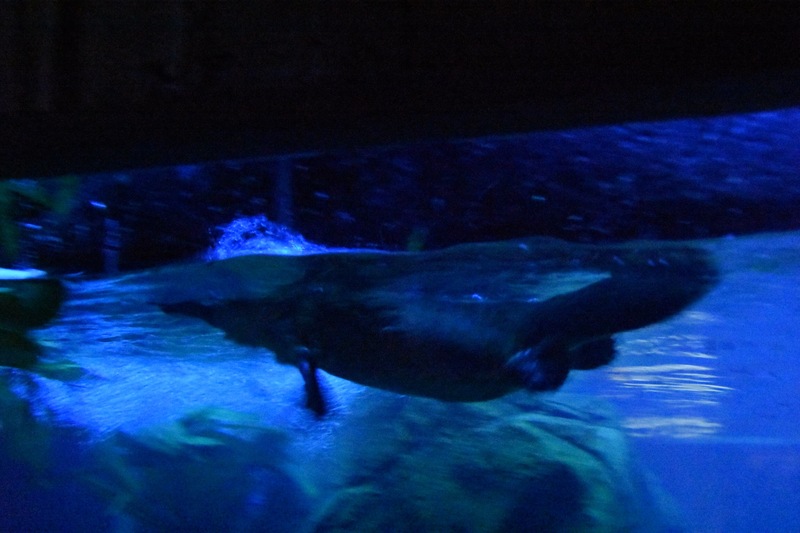 We got into the aquarium room just in time to see the platypus taking a morning swim. It went back and forth quickly and then climbed out and went back into its den. Luckily they had a camera in the top of its den, so we got to watch it there too. (No privacy for you, platypus!) The platypus is a monotreme, a mammal that lays eggs. They have webbed feet. The webs can be folded up when they are on land, and they can walk with their claws. When in the water, they close their eyes and ears and use their sensitive bill to find food. 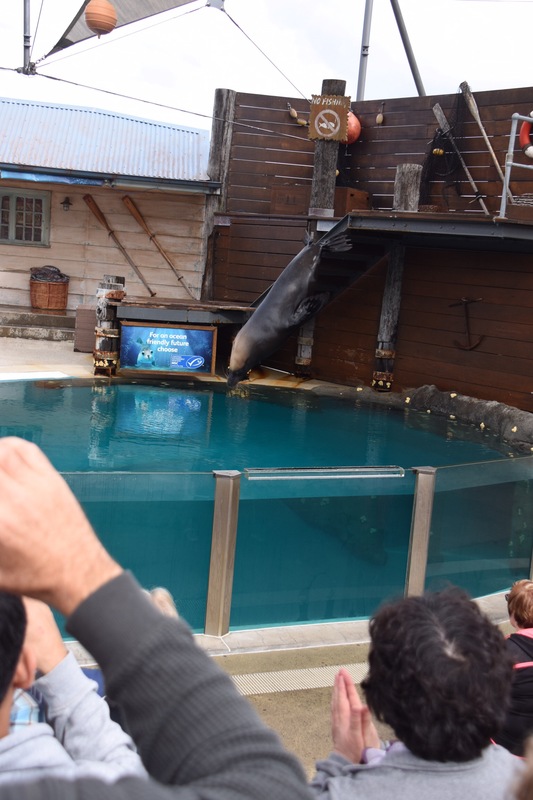 They can pick up electric pulses from any animal moving in the water. I didn’t realize this but the male platypus has a venomous spur on its back legs, one of only a handful of venomous mammals in the world. (Of course, if it’s venomous, it has to be from Australia.). If he gets you with his spur, you can expect to go the hospital, and even morphine won’t help much. It will take about a month for the pain to subside. 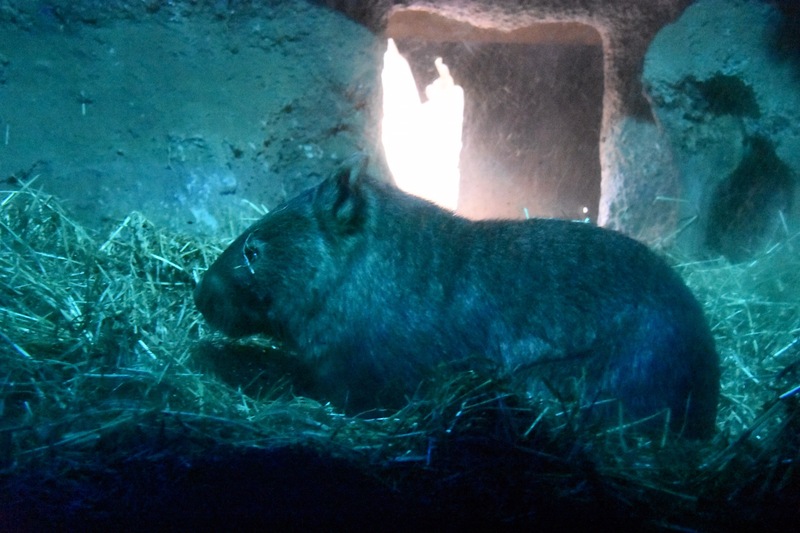 We walked back outside the aquarium and found a wombat in its den, visible through the glass. Shawn walked us through an aviary and showed us some cool birds before escorting us to the restaurant. We all received a cupcake and a drink and laughed about our adventures this morning. Shawn took his leave of us, and we finished our snack and bade our goodbyes to the Kanga Boxer/Screamer and his family. Our zoo admission ticket entitled us to spend the entire day there, but we needed to be back to the bridge area by 3:45 PM for our climb. It was about noon. We decided to make a strategy to maximize our animal spotting. But first, a little entertainment. We went to the trained seal show at Genene’s request. She surprises me. I never know who I am going to get with her these days. Sometimes she wants to act older than she is. Other times, she wants to do “little girl” things. I actually prefer the “little girl” things now because I know how few and far between they are about to be. 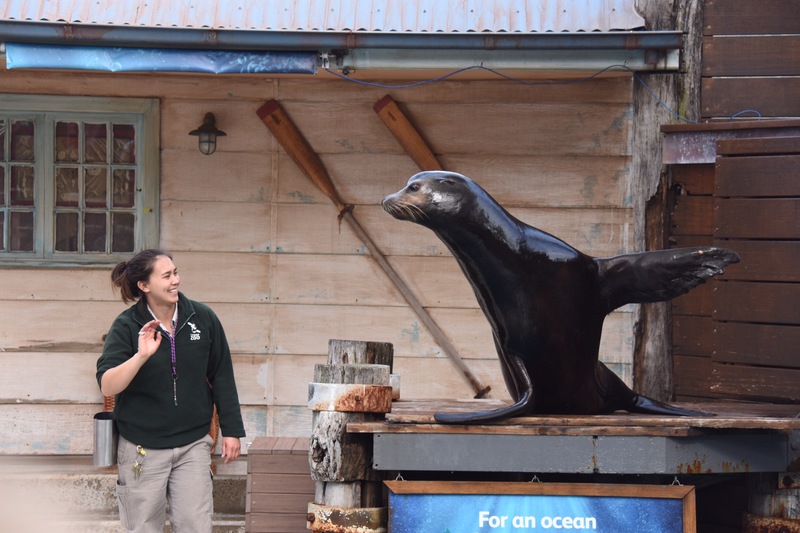 Let’s go see the seals! The show was lively and fun. 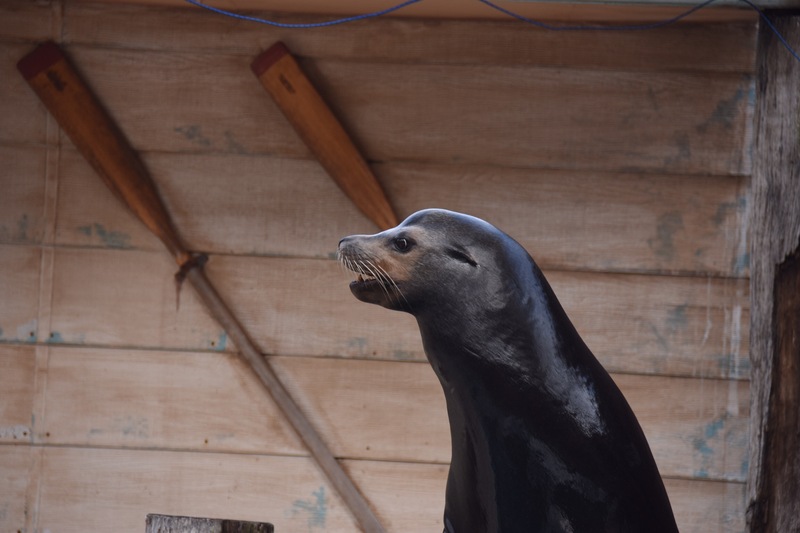 I couldn’t believe the size of some of their seals. 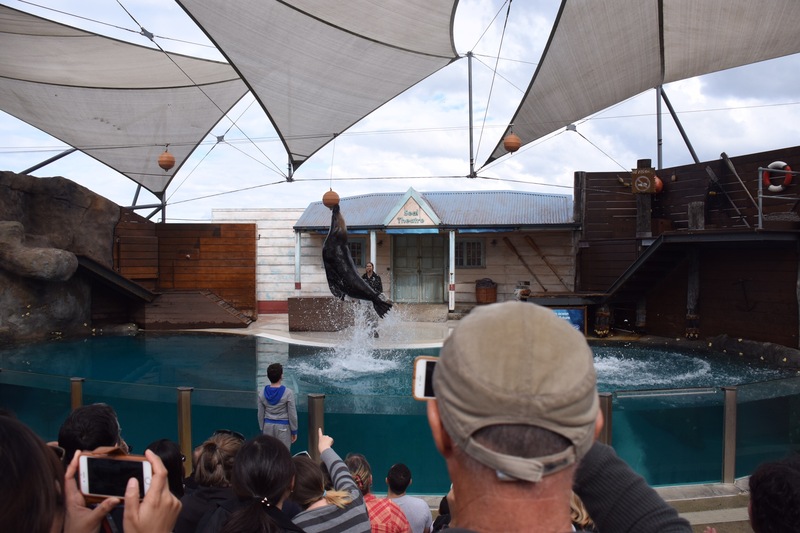 The Houston zoo has a similar show but their seals are tiny in comparison. I actually got a little teary eyed during one part of the routine. 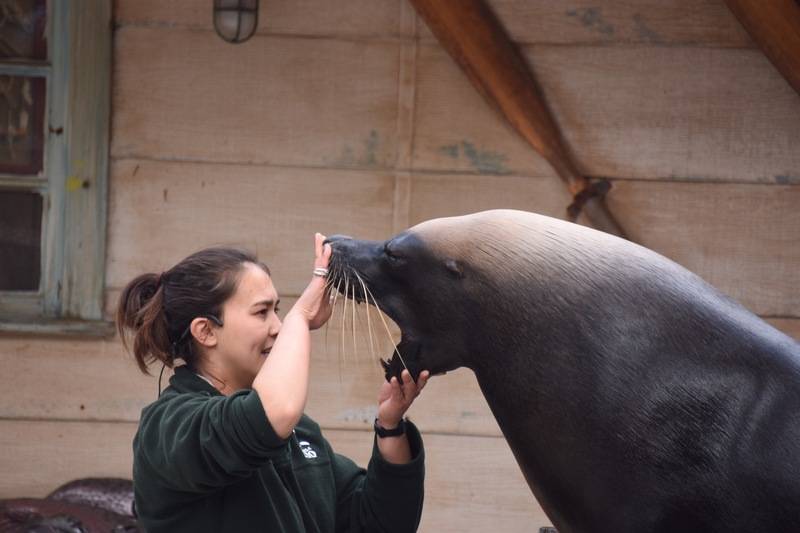 They had a trained seal showing us the dangers that wild seals face in their habitat due to humans. 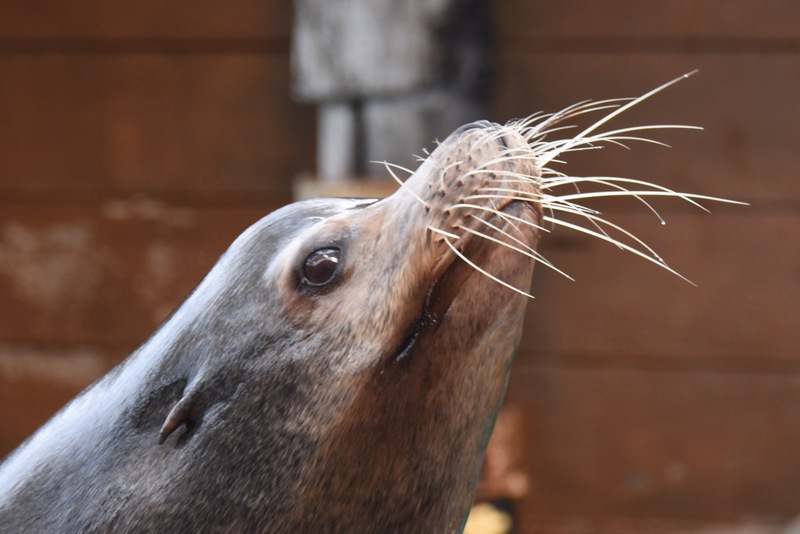 This beautiful creature, who ought to be in the wild himself, was instead spending his afternoon responding to whistles and fish treats while pulling up fish nets, trash, and plastic to show the crowd how we damage the environment. The irony was not lost on me. The show finished. We hit the exit and tried to figure out the “must-dos.” We skipped the elephants and all the African animals. We have seen them in the wild, and seeing them in a zoo gives me no joy. Instead we opted for the Australian bush walk and the Blue Mountain walk. We got to see a Tasmanian devil, a lazy fellow who stayed in his hidey hole. I did not get a good shot of him. The zoo is on a prime piece of real estate, with harbor views all around. This turtle sat on this rock in this position so long that I was convinced that he was a fake. And then he moved. 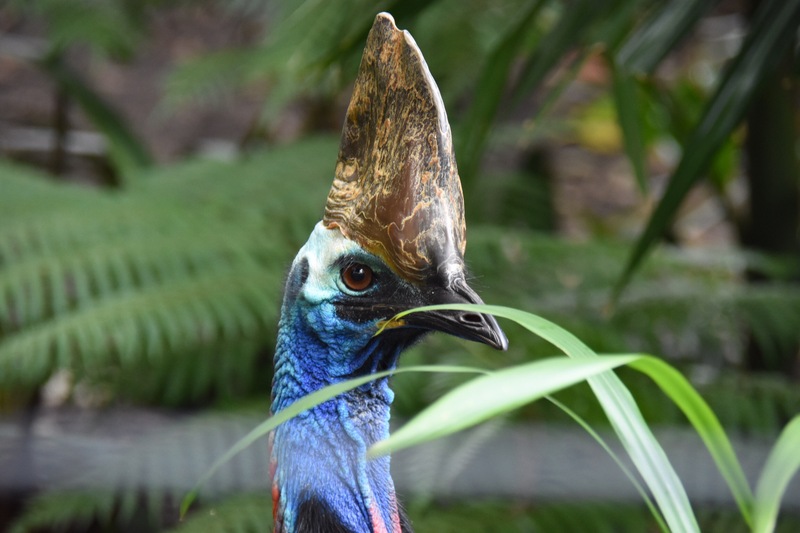 Our last “must-do” was the cassowary. 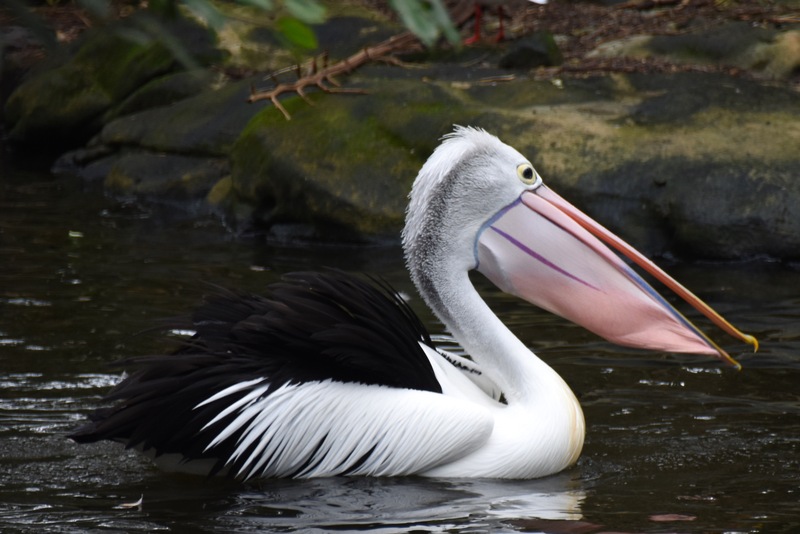 We had not been fortunate enough to see it in the wild in the Daintree, but we knew the zoo had them. If only we could find them! The zoo is set in a hillside with lots of windy paths and sidetracks. Furthermore, there were several areas that were under construction so even when we followed the map, we often hit dead ends. We persevered and we were rewarded. 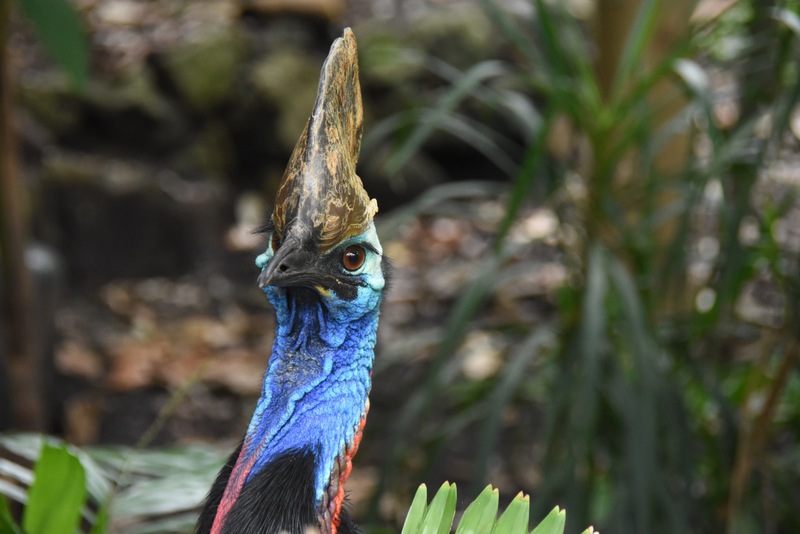 The cassowary truly is a remarkable bird, like something left over from the Land of the Lost or Jurassic Park dinosaur days. 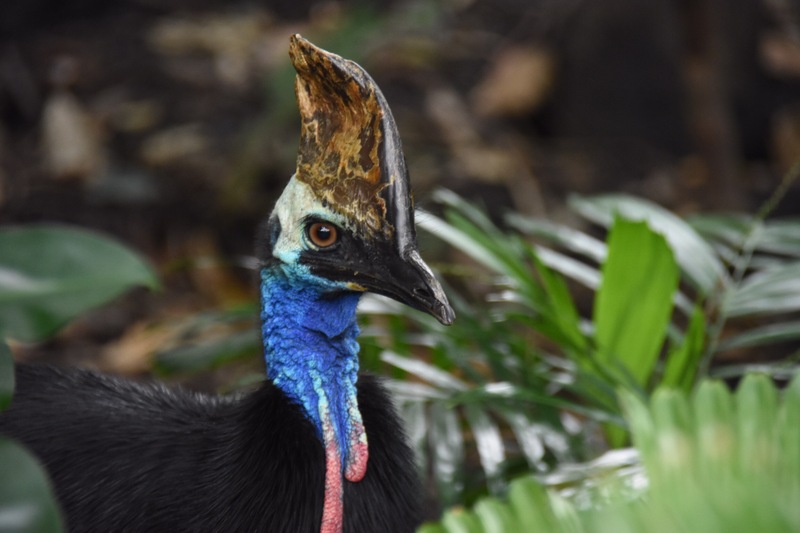 There are fewer than 1,000 cassowaries left in the wild. Their habitat is encroached upon by humans, and they often get hit by cars and attacked by dogs. 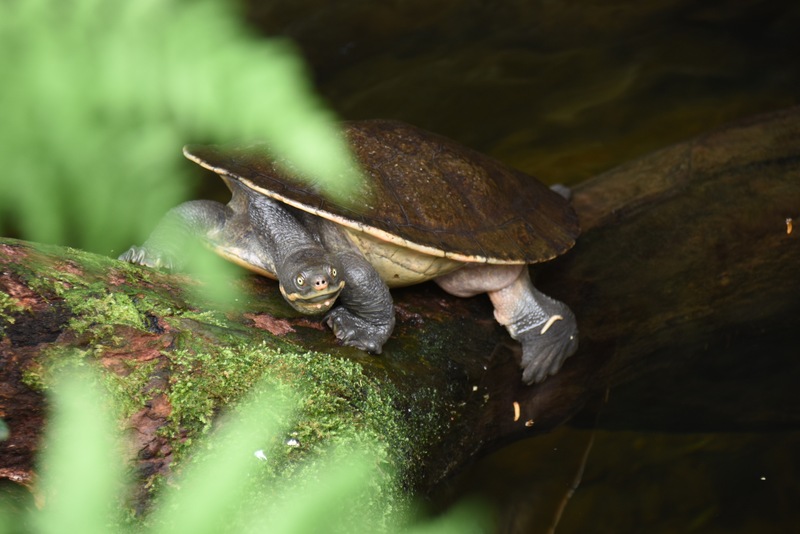 They are known as a keystone species crucial to the biodiversity in the rainforest. They eat over 238 species of plants and thus spread the seeds around. They are beautiful, imposing creatures. I am not sure I would want to see one in the wild with no fence separating me from its razor-sharp claws. 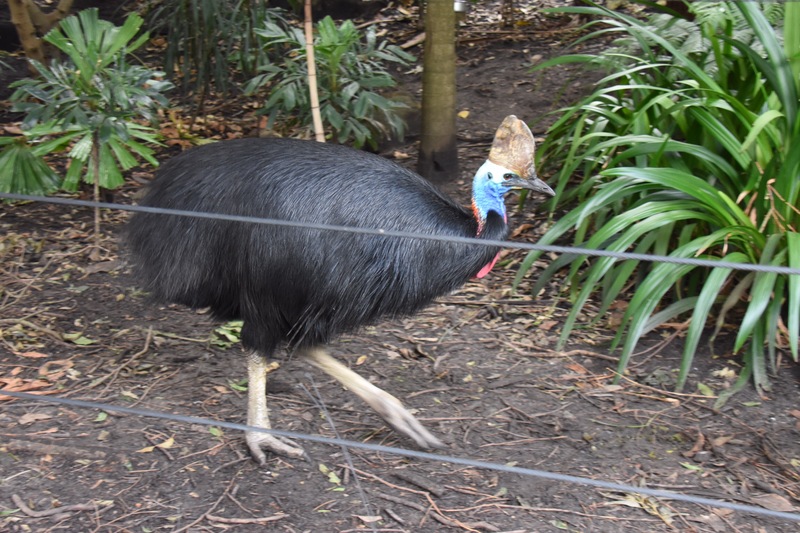 By the time we finally checked the cassowary off our list, it was after 2 pm and we hadn’t had lunch. We were supposed to be at the bridge climb rendez vous point by 3:45 PM so we needed to get moving quickly. 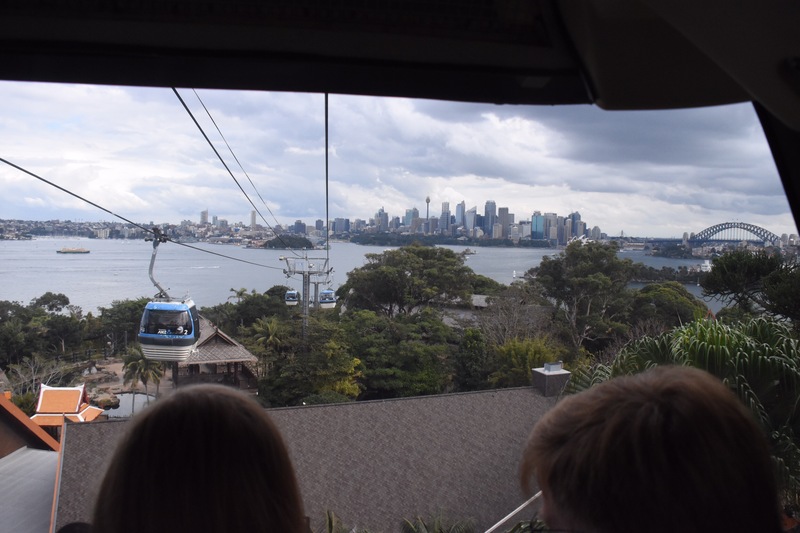 We caught the sky bridge cable car to the bottom of the zoo so that we could ride the ferry back to the Circular Quay, a short walk from our hotel at Rocks. 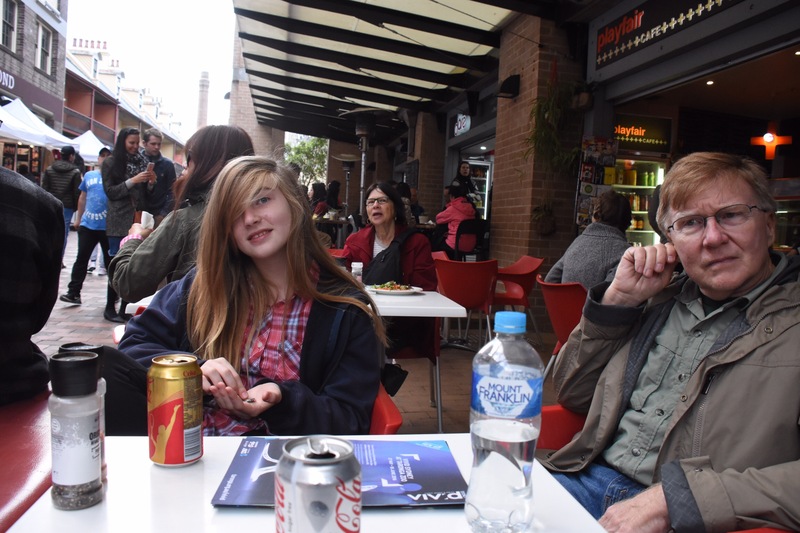 We had a quick sandwich at a shop in the Rocks. 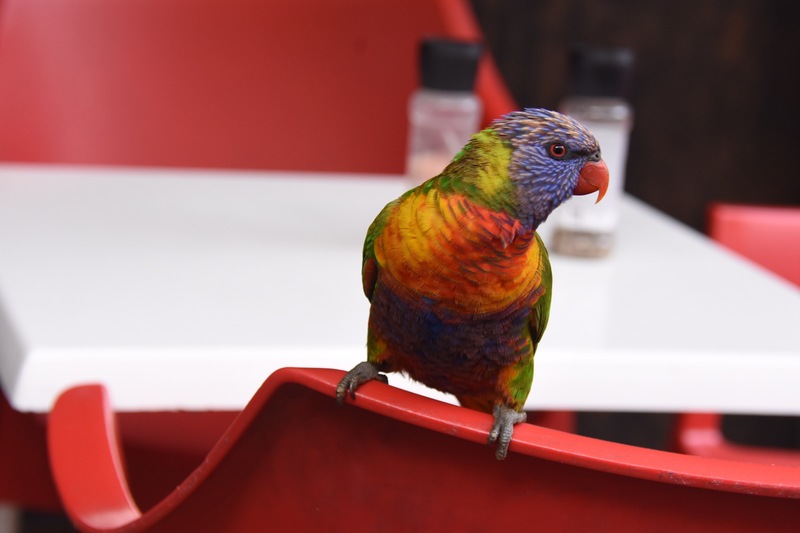 As we were finishing our meal, this pretty boy perched in the chair beside us. We did not even have time to go back to our hotel and freshen up. 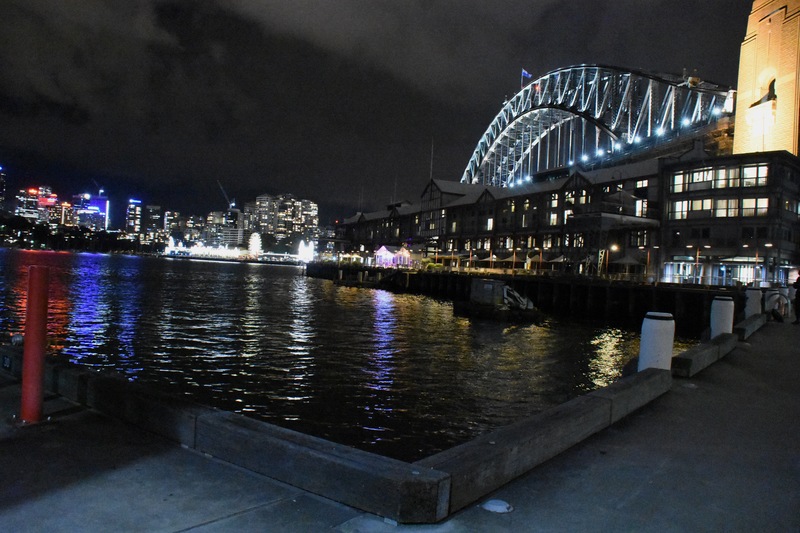 We headed straight to the bridge, where we met our guide for the evening, an affable “born and bred” Sydneysider named Scott. In a previous life, he had a desk job. He says he can never go back. While we waited for the tour to start, we looked at the photos of all the celebrities who had made the climb before us. Oprah Winfrey, Nicole Kidman, Vince Vaughn, Eva Longoria, Demi Lovato, David Hasselhoff, Bill Gates, Antonio Banderas, Usain Bolt, Will Ferrell, Kevin Spacey, Emma Thompson, Hilary Duff, Justin Timberlake, Robert DeNiro, Steve Irwin, Prince Harry, Ben Stiller, Cate Blanchett, Pierce Brosnan, the entire cast of “Modern Family”–these are just a few of the more than 3 million people who have made the climb. 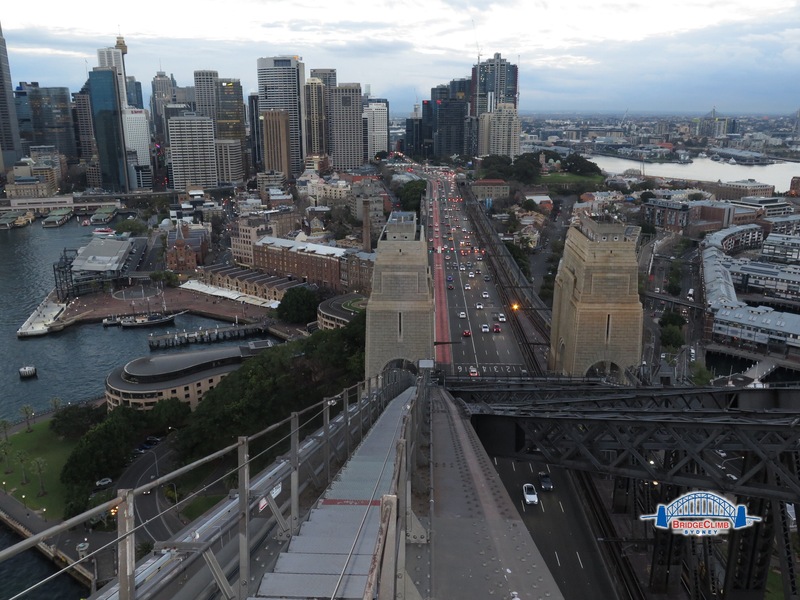 Sydneysiders call the bridge the “coathanger.” It’s 3,769 feet long, 439 feet high and 160 feet wide. It weighs 58,202 tons. It’s the largest and heaviest steel arch in the world. Construction started in 1922. The two halves of the arch were built outward from each shore. It took seven years of toil by 1400 workers to get the arch to meet in the middle. They were only eight inches apart! This was long before the days of computers and Autocad, so getting the arches to meet in the middle was an awesome engineering feat. Workers bolted them together in 1930, and the bridge was opened to the public two years later. There was a group of 12 of us on the tour. There were people from Australia, the US, England, Columbia and Japan. It was truly an international crew. First we all had to pass a breathalyzer test, even Genene. You can’t drink and climb! I am pleased to say that it was the first time I have ever had one used on me. We were all stone cold sober, so there were no issues. Next we had to remove all loose items from our pockets. Even a coin can become a deadly projectile when dropped from the top of the bridge. Absolutely no phones or cameras would be allowed. Everything had to go into a locker. Next we were fitted into a very attractive one-piece jumpsuit. Its blue/gray color is designed to help climbers blend into the bridge and thus not distract the cars driving across it. It has the added benefit of making you look like an extra from a Star Trek episode. (At least we weren’t wearing red. Everyone knows that the Star Trek characters who wear red die before the first commercial.) 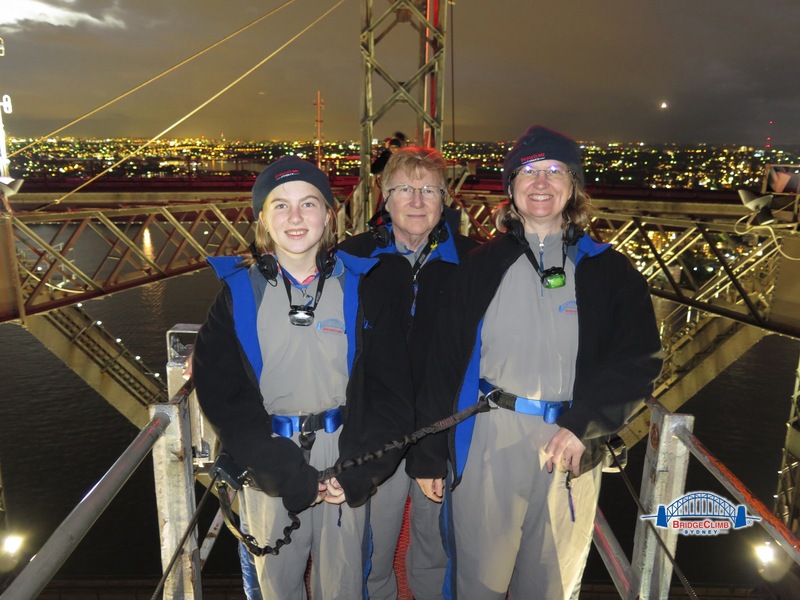 Next we got fitted with a belt which had a carabiner-like rope that attached us to cabling on the bridge. 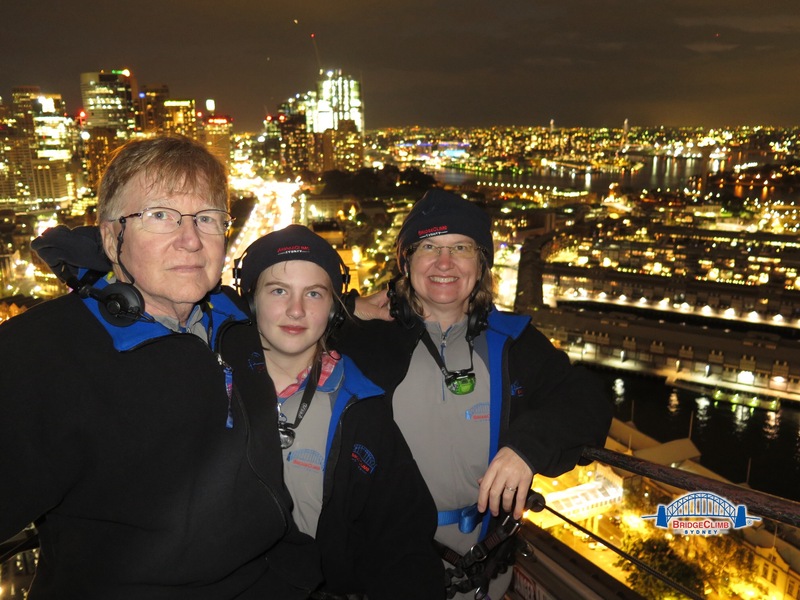 We received headsets with radios (we could hear Scott, but we did not have microphones), fleece jackets, rain jackets, hankies, croakies for our glasses, a beanie cap, a headlamp. Every single bit of it was attached to the jumpsuit by a clip. Nothing was going to fly off that bridge. 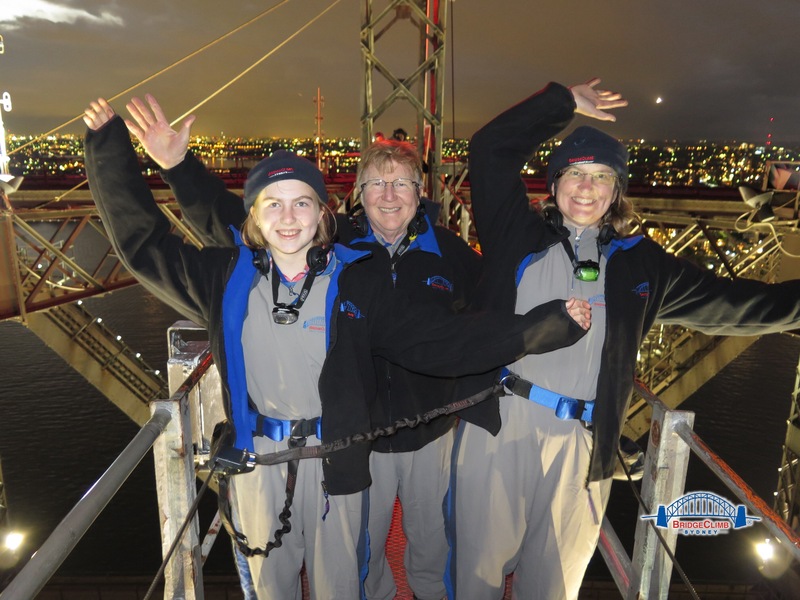 Our practice run complete, we headed out onto the bridge. We traveled single file. There was a family from California and a man from Hawaii in front of me. Genene was behind, and Greg was behind her. The lady who was afraid of heights was behind Greg, and she started to lag almost immediately. Scott was at the front of the pack leading the tour. Greg was worried about the lagging lady, but he did not know how to get Scott’s attention. Greg took advantage of one of his gifts: he can whistle very loudly. He uses it to call Genene to dinner and get the cats to come in. He did his best wolf whistle. Scott’s voice came over the radio: “Did you just whistle at me? !” Greg gestured at the lady behind. When we got alongside Scott, he told Greg that we did not have to worry at all and we certainly did not need to whistle. Scott said he had his eye on everyone. After a few minutes, the lady seemed to relax, and we all went to the top together. We had a good laugh when we got back down and saw this one of Greg with his eyes tightly shut. The sunset was pretty on this day, but not spectacular. We climbed every one of these steps. 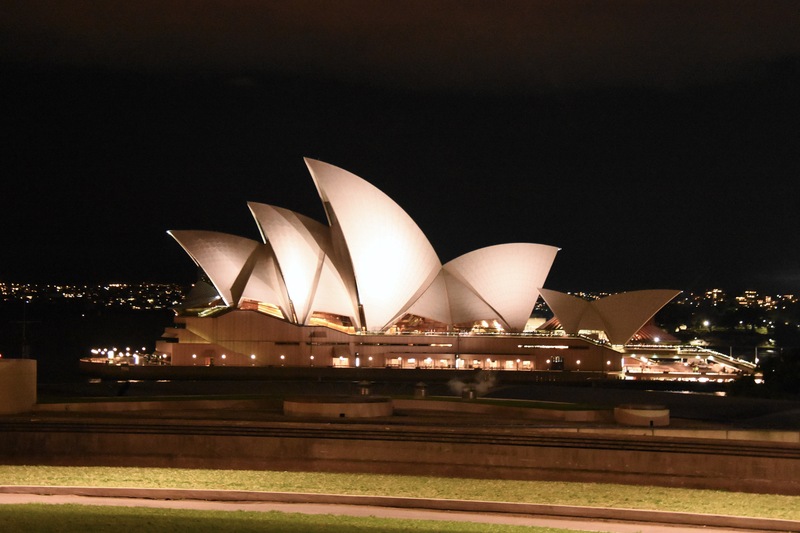 The sun went down and the lights of Sydney came on. Scott took a short video of us at the top. He suggested that we say something like “happy birthday” so that we could send it to our friends on their birthdays. Genene and I overruled that suggestion and told Greg that we wanted to call the Hogs. When Scott shouted “Action!”, Genene and I started the “Woo Pig Sooie.” Greg was a little confused and so his line went something like “happ…ooooo pig sooie!” He was a child actor in Richmond, Virginia and worked with his father in regional theatre there. We couldn’t believe he flubbed his lines like that! Along the way up and down, Scott told us about the millions of rivets used in the construction, many of which are in the bottom of the harbor. There were many deaths during construction, but one man–only one–actually survived a fall from the bridge. We were exhilarated by the climb. 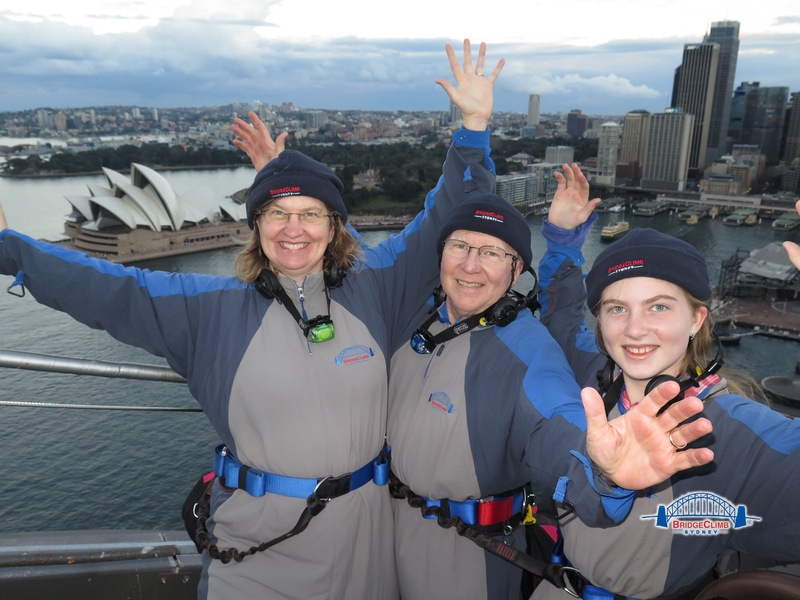 We had finished strong in Sydney! We got undressed, reclaimed our gear from the lockers, and purchased our photos and souvenirs. 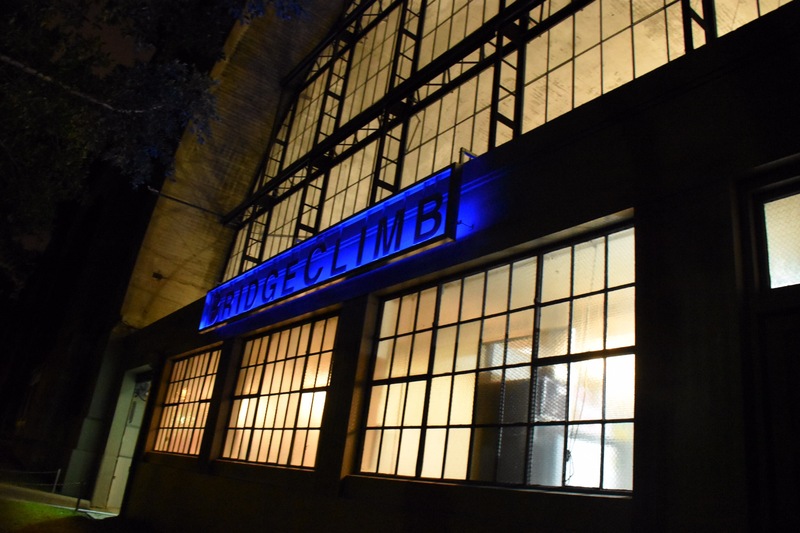 We hit the street, took one last look at the bridge climb building, and started strolling back through the Rocks. I got one last shot of the Opera House. What a diva! Always posing! 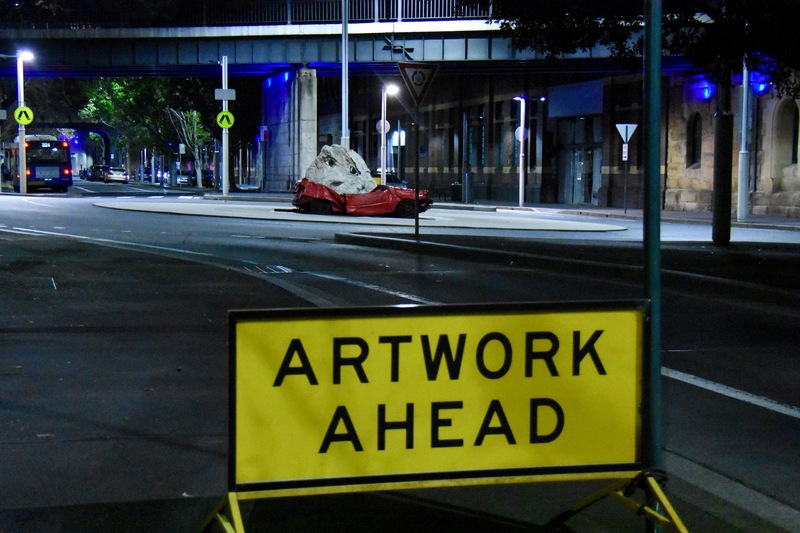 Like any major metropolitan area, Sydney has its share of modern art in public spaces. This next piece sits in the median, and I guess it must have caused a few wrecks because there is actually a sign to warn motorists that they are not looking at a wreck. 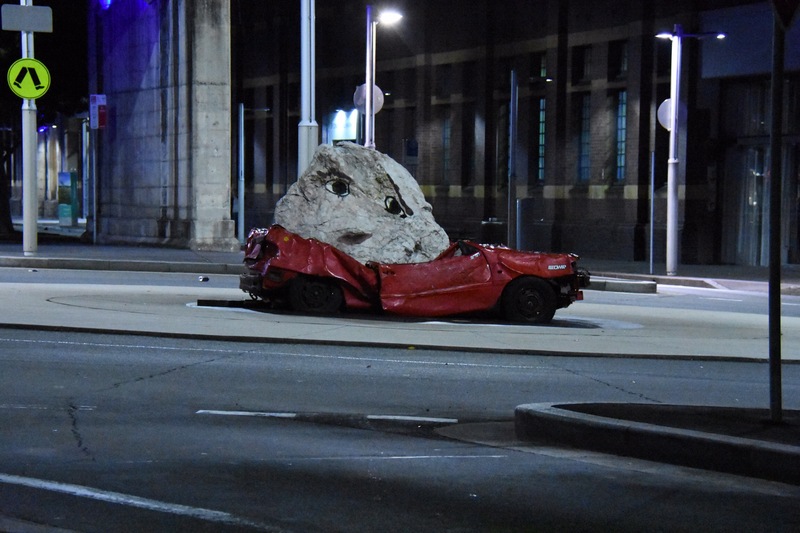 “Still Life with Stone and Car” by American born sculptor Jimmie Durham. 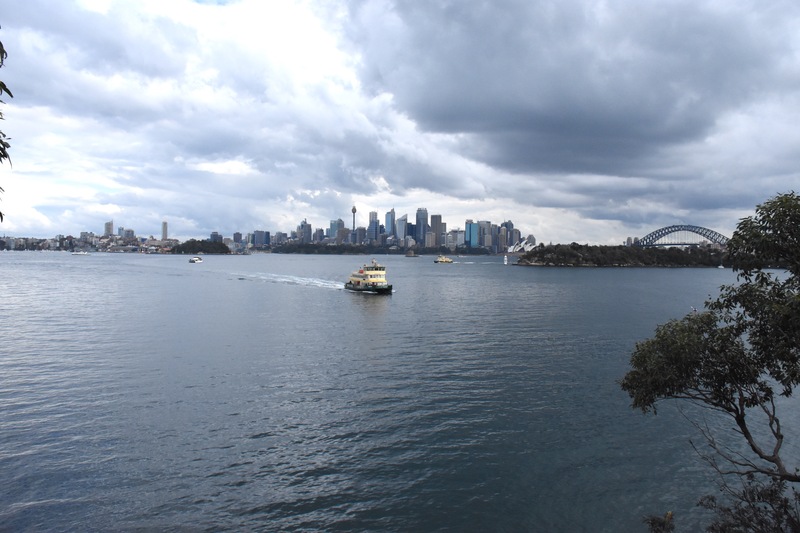 My last shot of Sydney this evening: thanks for a great day, Coathanger! We headed back to our neighborhood exhausted from all the day’s activity. It’s our usual traveling custom to return to a favorite place for our last evening in a city. We all wanted to have noodles at Lotus Dumpling Bar. 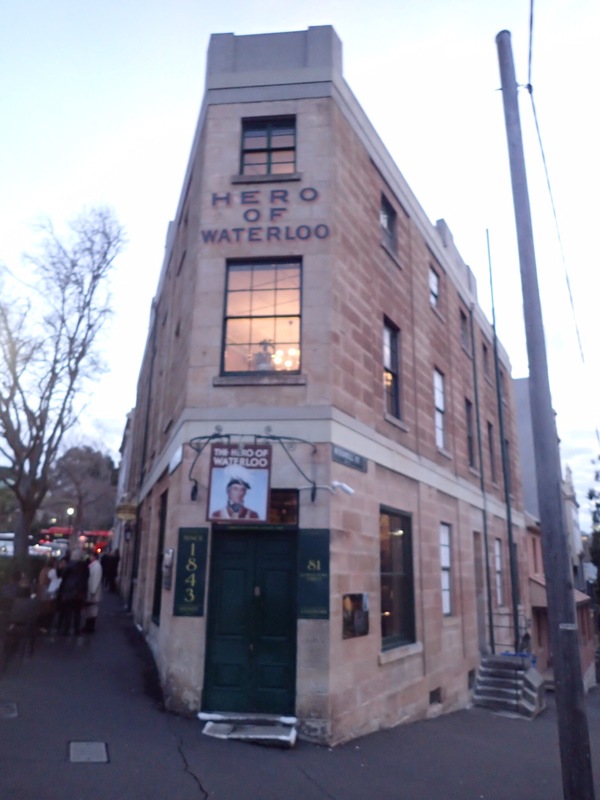 It had been our favorite Sydney meal. We had no reservations, and the small restaurant was completely packed. We were disappointed but we should have planned better. We walked back to the hotel, sat in the bar area and ate fish and chips, hamburger and pork neck. It was all very good, and we were happy at having been able to accomplish so much on our last day. Genene really liked eating at the hotel because she could go straight the room afterward and start getting ready for bed. She also likes getting away from her boring parents for a few minutes. We knew she would be safe and so we stayed in the lobby. Greg finished his last Boag’s beer, and I closed out the night with a glass of Australian red wine. I wish we had not gotten ill on the journey. I could have drunk a lot more Shiraz! Because we never really got unpacked, packing up was pretty easy. We would have to leave before the fabulous Pier One began serving breakfast downstairs, so we put in a room service order and hit the rack. We hated to leave Pier One in the Rocks. It turned out to be our favorite hotel of the stay. Their hospitality was flawless. 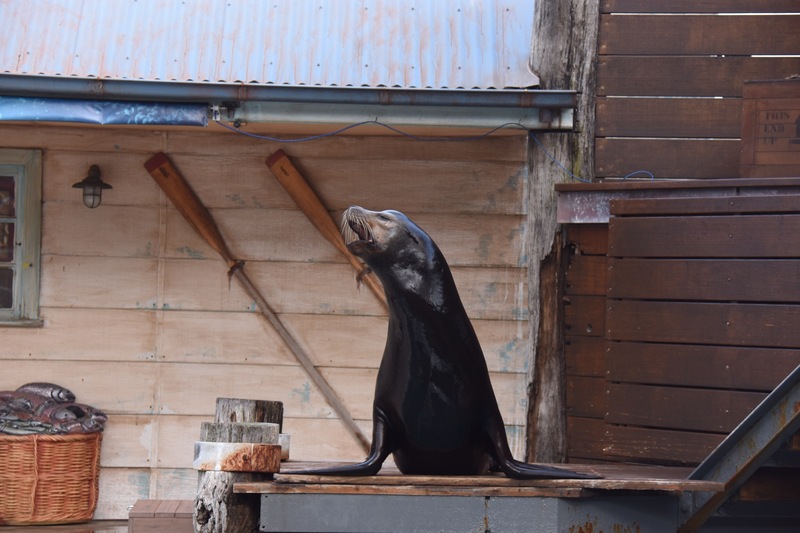 I wanted to love Southern Ocean Lodge on Kangaroo Island, and I am sure I would have had a completely different impression of it if we all hadn’t gotten ill there. It’s easy to demonstrate hospitality when everything is going right. It is when things go wrong that you find out how good (or not so good) that a place is. 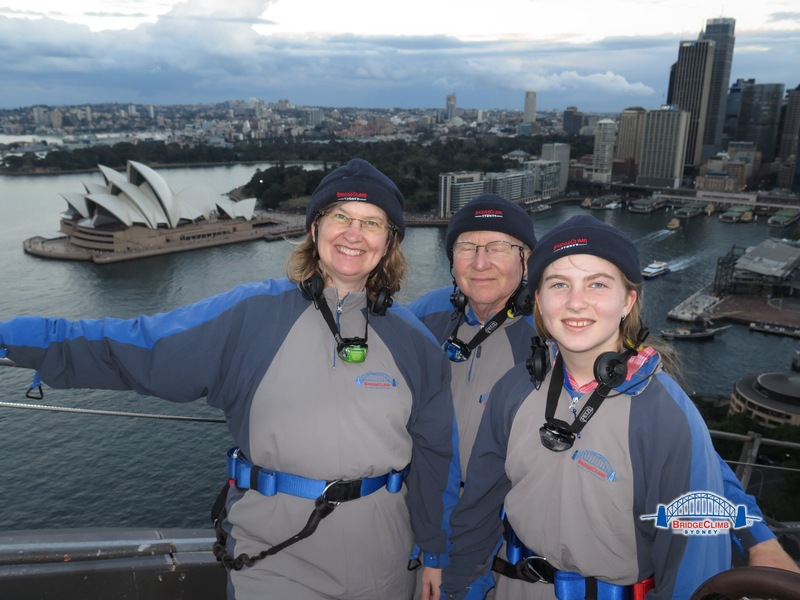 Southern Ocean Lodge did not properly handle the situation with the mystery illness. Pier One did. Southern Ocean Lodge tried to brew peppermint tea. Pier One sent for the doctor. Pier One-1; Southern Ocean Lodge-zero! Anyway, we said our goodbyes to Pier One and to Australia. Our driver arrived at 6:50 AM, and our early morning ride to the airport was uneventful. 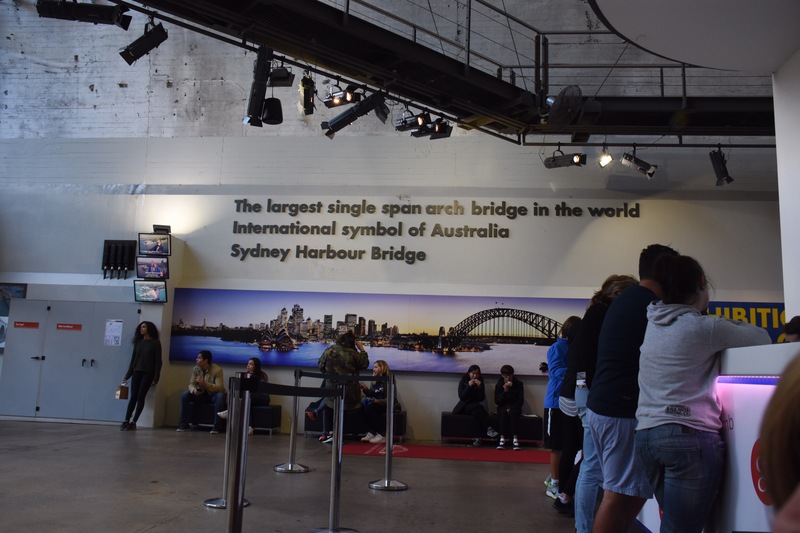 It took us a little while to figure out where the customs and immigration line was in the Sydney airport, but it was easy once we did. We didn’t even talk to a human. They just scanned our passports, took our photos and let us through. The plane from Sydney to Los Angeles was supposed to take off at 9:50 AM, but we got a bit of a late start. The flight duration was just about 14 hours, and we were slated to arrive at LAX at 6:30 AM on Monday. We would arrive in Los Angeles BEFORE we left Sydney. We were getting our day back! Qantas must not have heard about me yet, because they let me on board the plane. 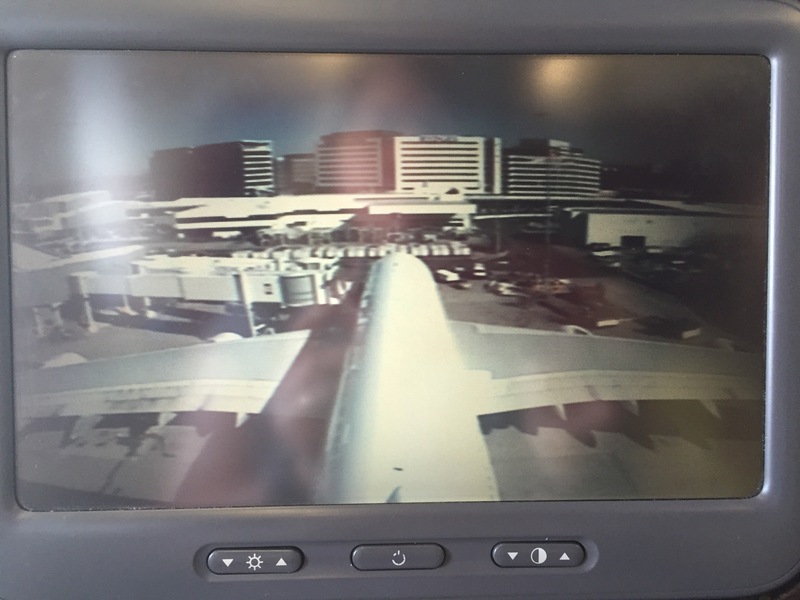 I spent a lot of time looking at their “tailcam”, which was broadcast on our entertainment systems at our seats. It was a hoot to watch the plane take off and land. My sleeping beauties wasted no time getting into the position. We arrived at LAX about an hour later than scheduled. We were supposed to have had two hours for our connection, but an hour of that was gone. Qantas and American Airlines took the liberty of bumping us from our scheduled flight from LAX to Houston. Instead they booked us on a later flight to go to Dallas and then to Houston. It would add hours to our trip! ARGH! 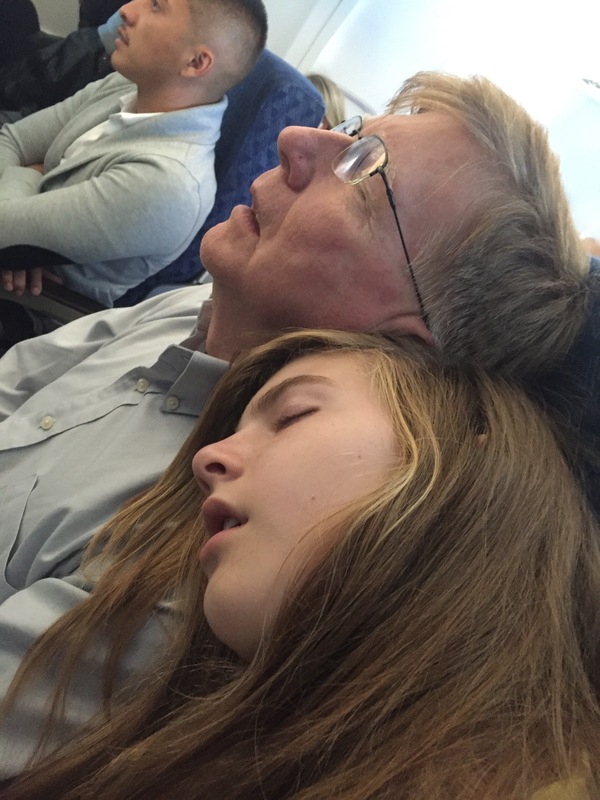 We did not want to ride two more planes and sit in the airports! We were so aggravated. We ran through customs and immigration. By the way, it always amazes me that most of the rude treatment that we get “on the road” comes from US immigration agents. They can be little tyrants. We flashed our Global Entry in the hopes of speeding things up. Greg and I both got selected for a random explosives check, which was a little annoying since we have both undergone background checks to get qualified for Global Entry. While they are wasting time with us, some real bad guy is getting through the line! The agents did not communicate very well with each other in Greg’s situation. One of them sent him over to the explosives check line but didn’t tell the other one that it was a random check. Then they started in with the questions: “Why are you in this line, sir?” “Well, because your man sent me here!” Greg was tired and I thought he was going to get himself into trouble by giving them some attitude. Luckily we made it through pretty quickly after the initial confusion, and we raced up to the American Airlines counter so that we could press our case to be put back on our scheduled flight. We were sick of airports and ready to be home. What we didn’t know then was that on this day, there was some kind of major glitch with Delta, and they had large scale flight cancellations. The lady at the American counter acted very sympathetic and clicked her mouse for about 15 minutes, looking for alternatives. (Remember Greg Focker in the “Meet the Parents ” airline check-in scene?) I began to wonder if the gate agent was really doing anything or if she was just clicking the keyboard and mouse long enough to make sure that she burned all of our extra time down before telling us that she couldn’t find anything. In any event, after some time, she gave us the bad news that we would have to fly to Dallas and then to Houston. She checked our bags back through and sent us toward our gate, Gate 69. We passed through the doors and the real fun began. The sign said, “Gate 1-40” and had an arrow to the left. “Gate 75-112” with an arrow to the right. Where the bloody heck was gate 69? We wandered aimlessly until we found someone in a uniform to ask. He started laughing and said, “Oh, that gate. I’m not going to give you instructions to the gate, because you will just get lost. I’m going to give you instructions to get you to the next person in a uniform like me, and they will send you on to the gate.” And so it was. We found the next uniformed lady, and she pointed us down a hallway and down a staircase. We arrived at a glass door to the exterior of the airport! We had to wait for a bus to get us, and we drove around on the tarmac. I promise that I am not making this part up: the bus was driving around on the runways and the tarmac with the planes! It was unbelievable. We finally arrived at Gate 69 FROM THE OUTSIDE of the airport. We had to climb a set of temporary stairs that looked like scaffolding and go back into the airport. How could any of this be ADA compliant? How could any of it be secure? It was crazy. LAX was a zoo. There were not enough seats, and people were laying in the floor and walking shoulder to shoulder down the narrow hallways in the gate area. Get us on the plane! Luckily our flight was on time, and we got the heck out of LAX. I had not been there in years. It’s an absolute armpit of an airport, and I cannot believe this is an American airport. It looked like something out of a third world country. I pity anyone who is trying to come for a visit to the United States for the first time and has to come through LAX. What a first impression it must create! Okay, I’ll climb off my soapbox. We got to Dallas on time, and DFW was much more civilized. We were exhausted and punch drunk by the time we boarded our last flight from Dallas to Houston. We arrived in Houston in the late afternoon at around 5:00 PM. Our man from Action Limo was waiting on us, and we let him tote all the luggage. We were exhausted. We pulled up at the house before dark. The two best moments of any trip are getting underway and coming home. Our dog Nala was thrilled to see us, and the cats yowled with their usual displeasure. (They like to fuss at us when we have been gone.) I started my usual routine of washing clothes and unpacking. Our friends Scott and Michael left us some ready-made dinners in the refrigerator so we didn’t have to worry about food, thank goodness. There was a lot of red dirt from Uluru in our suitcases! I will have to go to work tomorrow, so there won’t be much rest for me until the weekend. I have been particularly slow getting my blogs done on this trip. I think part of it was because of the challenge associated with using a new program. Another factor was my busy work situation. I had to dive right in, so blogging had to be done on nights and weekends. Also, some of the time I would have spent blogging was spent filing complaints. I was so unhappy about what happened at Southern Ocean Lodge that I took some action. I tried to communicate with their management through our travel agent, but Southern Ocean Lodge was not interested in trying to make an amends. They didn’t think they had done anything wrong. I didn’t blame them for the illness. Anyone can get sick. It’s the secrecy that troubled me and the lack of communication about what was going on. Never mess with a mamma who has had to watch her child be sick for hours! 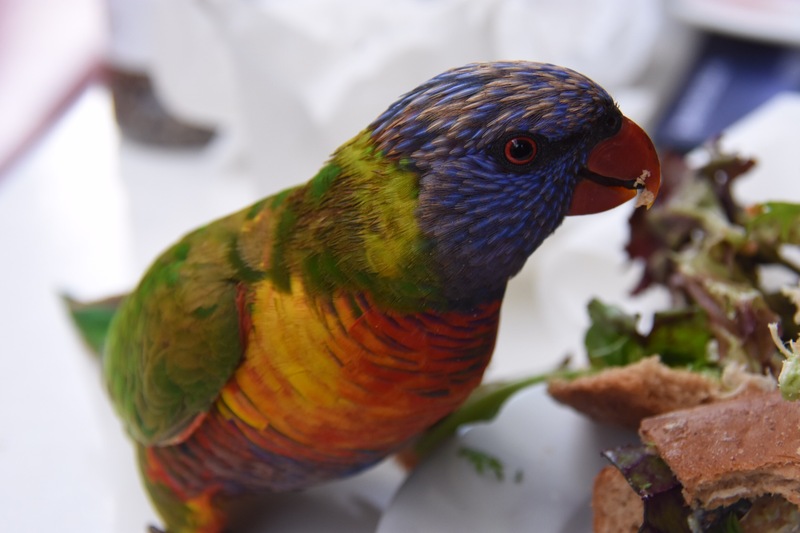 I filed a complaint of suspected food poisoning with the Health Department in Adelaide. I managed to get their establishment inspected, which gave me a little pleasure. I hope it gave them a bellyache to rival the one they gave us. The day the inspector arrived, there was nothing wrong in their kitchen, but that is not surprising. It was weeks later, and whatever happened was long over. We found out from the inspector that there were 10 sick guests and 6 or 7 sick employees in the lodge at the same time as we were. In a hotel with 21 rooms, I think that’s pretty significant. We still don’t know what happened and probably never will. Was it food poisoning or was it just some kind of highly contagious illness? We don’t know. What we do know is that their staff was not honest with us about how many people were ill. Sometimes the fanciest place is not the best place. Enough about them. When I ask Genene to tell me about her favorite day, she says it was the Daintree Rainforest tour. I think she was just thrilled to share the day with kids her age from her school in Houston. Genene has run into Rebecca at school at Awty several times now. 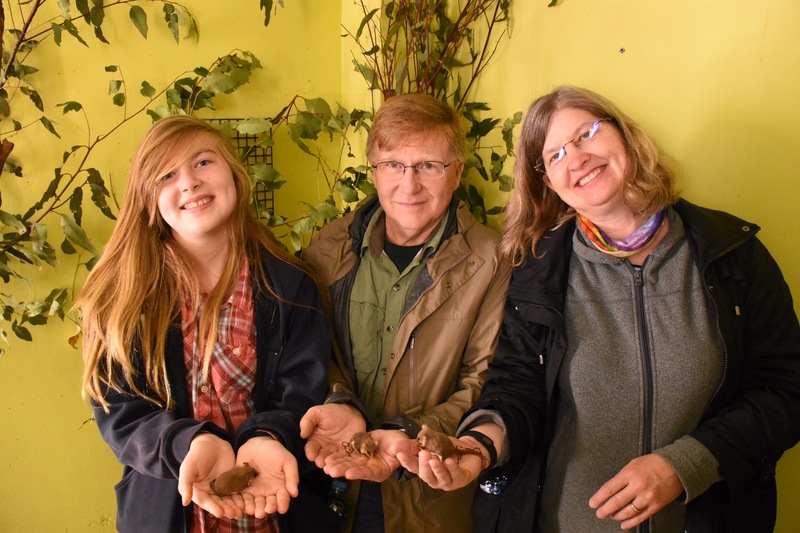 Rebecca even has some of Genene’s teachers, so Genene has been able to give her some tips. You never know who you will meet on the road. 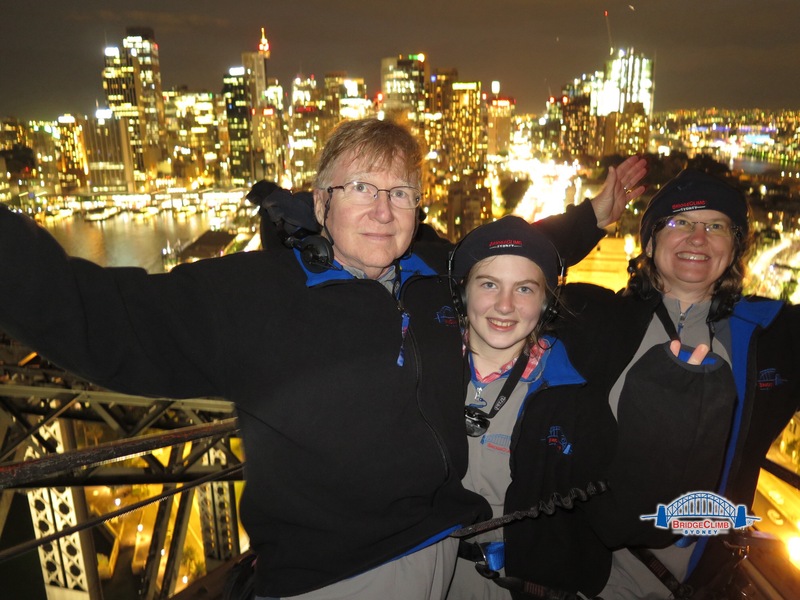 Greg’s favorite part of the trip was “anything in Sydney.” He loved the city and all it had to offer. My favorite thing was Uluru. I cannot tell you why. It was beautiful, magical, mystical. The best book that anyone can read to prepare for a trip to Australia is Bill Bryson’s “In a Sunburned Country.” I love all of Bryson’s work, but this book is a hilarious romp and will get you in the mood to travel Down Under. I referred to it time and time again while writing this blog. Read it before you go Down Under. What else did we learn from this trip? Don’t trust a marine biologist on the Great Barrier Reef. Don’t go drinking and swim with the crocodiles. Koalas can pee like a racehorse. Always take the helicopter ride. Never introduce a non-native species onto a continent. Ant butts taste like a cross between a Granny Smith apple and a lemon. Vegemite tastes like crap. Spread it paper thin! There is something magical about Uluru and Kata Tjuta. I have no idea what it is, but I want to go back and find out. Reminders of my father are everywhere, even in Australia. It is both comforting and sad. Thanks for coming along with us to the land Down Under. The country/continent is vast, and we couldn’t possibly see it all in two weeks. In fact, I think our itinerary was too ambitious. Even with all our traveling and time spent in the airports, we never even made it to the western coast. I also regret that we never had any real interaction with the aboriginal people. They’ve been there for 50,000 years. I guess they will be there when we go back. I will end the blog with the only word we learned from the Anangu. The word has many meanings. It can be used to greet someone and to say goodbye, much like the better-known “aloha” that the Hawaiians use. Its literal English translation is “good.” I like the symmetry of that. You greet someone by wishing them well: “good.” You send them away in the same hospitable way. Until next time…. It was a dark and stormy night. Just kidding. Bulwer-Lytton aside, last night was pretty bad. Genene finally stopped throwing up sometime after 10 PM. She was so thirsty, but each time she tried to take a few sips of water or Gatorade, she threw up again. Her belly needed a rest, and she finally just collapsed into blessed sleep. Greg seemed slightly better, having only tossed his cookies twice in the early evening before collapsing into fitful slumber. I felt like I was in the Monty Python “Bring out your dead!” scene from “Holy Grail.” I was mopping foreheads, packing bags, and trying to get things situated for this morning. We were moving again today. When we first arrived at the resort, I thought I would never want to leave. Now I just wanted to get us out of here and back to civilization. None of us wanted any part of breakfast at the resort. In the morning, Genene was just beginning to hold down some sips of Gatorade, and Greg just wanted to sleep until we had to go. I didn’t have any appetite, and my tummy felt just a bit off. I didn’t know whether I was just having sympathetic grumblings or whether something was really wrong. (When you spend time in a room with two people who are retching the evening away, you begin to think about joining them.) In any event, I did most of the packing because Greg and Genene still felt pretty low. I got everything into our bags and prepared to head out. The lodge wanted us out of our room by 8 AM, but I told them we weren’t leaving until the van was ready to load. They did not argue. 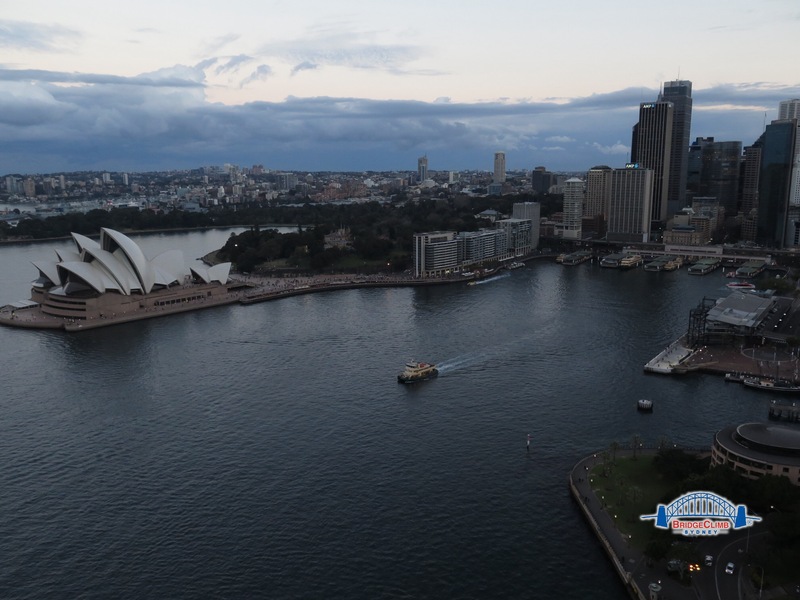 Just before we left our room (the aptly named Shipwreck Goulbourn), our travel agent phoned to let us know that our flight to Sydney had been canceled. And I thought the day couldn’t get any worse. The good news is that they had already booked us on another one. I was very happy that they had taken care of things for us, but it meant we would have a longer layover in Adelaide. As we left our room, a couple of the lodge waitstaff rushed up and exclaimed, “You didn’t get any breakfast! Would you like us to pack anything?” Ugh. No. We said thanks but no thanks. The massive double doors opened, and the staff all lined up to bid their goodbyes. Miss Peppermint Tea told me to have a pleasant journey. I was reminded of the Stepford lifeguard on the Barrier Reef. What the heck are you thinking of, lady? We are the walking dead here! We had discreetly asked the hotel manager if we could ride up front in the van, because I thought that would help us with carsickness. No one paid attention to our request, and we got shoved into the back of the van. It was completely loaded, and everyone was quiet on the hourlong ride back to Kingscote except for the little California boy who had spent his time two nights ago chasing kangaroos. He was in the front seat with the driver yapping about nothing, and I wanted to put a pillow over his head. I was just hoping that Greg and Genene could keep their act together–so to speak–so we would not have to stop the van. I had packed an entire roll of toilet paper into the backpack just in case. Happily we all made it to the airport and got checked in. There weren’t even any metal detectors at this airport. I don’t think our bags went through any screening, except for being weighed. I guess they figure if you flew to the island you must be okay. As we sat in the small terminal gate area waiting for the plane, we began comparing notes with other people from Southern Ocean Lodge. Three of the four members of the family from Calgary were ill. The family from Des Moines had two sick people. We saw another fellow sitting in the corner with his head hanging low. Then we found out that one of the van drivers was a substitute because the regular employee was afflicted with illness. This seemed like a lot of sick people for a resort that only has 21 rooms. Greg and I began to get more annoyed as we thought about it. When we were sitting in our room all day yesterday, we were only made aware of one other person who had been ill. It turned out that a lot more of us were sick. Was it food poisoning? Flu? Virus? We didn’t know, but we knew there were several of us afflicted. I was dismayed that we were not offered better onsite medical care or first aid. With 20/20 hindsight and knowing how many people were affected, I thought that the resort should have brought a doctor to all of us, or at least gone out for a stockpile of medicine and electrolytes. We watched the incoming plane unload, and the Southern Ocean Lodge people were waiting–all smiles and charm–to greet the newcomers. I thought about saying something to them, perhaps giving a warning. In the end, I just sat quietly. I hope it was the right decision. Our flight back to Adelaide was 20 minutes. I felt like we were returning to civilization. Our airline, REX, was efficient. During the brief flight, they offered a small bottle of water and a single fruity Mentos. I thought it was a nice touch for the little puddle jumper. We had stored our large bags with REX in Adelaide while we went to the island, and they were waiting for us in Adelaide on the luggage carousel, just as promised. At least that part worked right. We took a moment to unpack the safari duffels and repack everything into our three rolling bags, and we headed into the main terminal. Greg and Genene felt like eating lunch, and so did I. That was a good sign. We didn’t miss those fancy gastronomical experiences one bit. We found a café, and each of us had a simple croissant with ham and cheese and a big old fully leaded Coke. Greg fell asleep in the terminal. He still felt pretty weak. 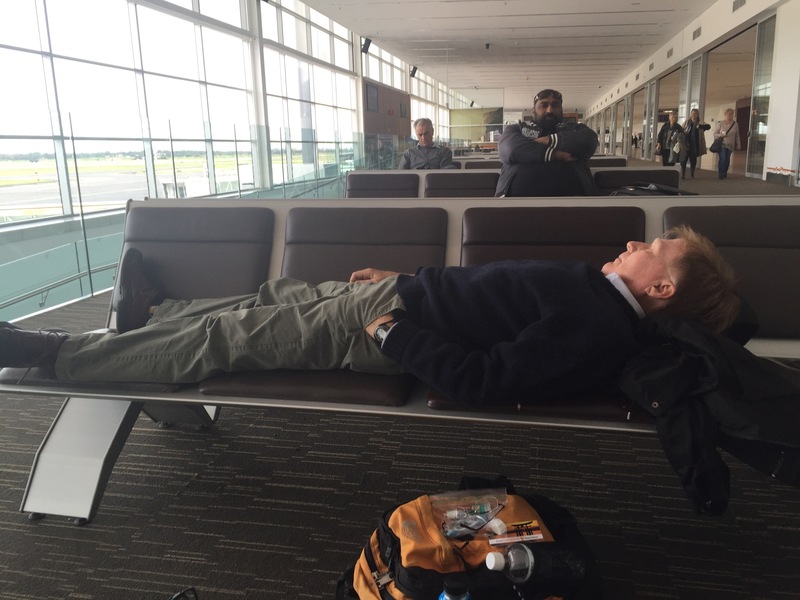 Our layover in the airport in Adelaide was long, about five hours. Genene sat quietly and listened to music on her iPhone. I tried to nap but couldn’t manage it. I began to feel a little “off”. I hoped it was just my imagination but alas…. The time to leave finally came. It took us forever to board the plane, and we were so far in the back that we loaded from the rear door of the aircraft. Once aboard, I had a small altercation with a rude man who thought he should take up the entire overhead bin with his jacket and briefcase. When I tried to move it to make room for my camera backpack, he admonished me not to wrinkle his jacket. I said, “Why don’t you consolidate it then?” (After all, his jacket and a small briefcase were taking up half the bin.) He got up to move it and then told me my bag was too large for compartment. I finally said never mind and went forward a few more rows and found a spot for my bag. On the way back, I looked at him and said, “Thanks for your help.” My heart was gladdened a few minutes later when a big burly man put his gear on top of the guy’s jacket. I’ll bet the Bin Hog didn’t argue with the Muscle Man quite so much. Just as we got to cruising altitude, I came to the sad but inevitable conclusion that my stomach rumblings were not in my imagination. I knew I was going to be sick. Luckily we were only three rows from the back of the plane. I jumped up quickly, airsick bag in hand, and managed to make it to the galley area in the back of the plane where the jump seats are. I was out of sight of most everyone, thank goodness, when I tossed up the first load. The flight attendant was a sweet man. He was my angel, the Angel of the Qantas. I couldn’t believe how helpful he was. He got a cold wet napkin for my face and gave me some Vicks “lollies” (candies) to “get the yucky taste out.” I felt miserable. He let me sit in the jump seat for the entire flight with my head hanging low. The flight was just under two hours, which seemed like an eternity as I sat there watching them unload coffee and snacks from the rear galley. I walked back to my seat in disgrace, tracking the evidence of my shame along behind me. My clothes were spotted. I stank. With each step, I could feel the stickiness beneath my feet. I can never fly Qantas again without wearing a bag over my head. When the plane landed, I let every single person get off the plane before I got up, including the three rows behind me. They deserved to get off first for having to put up with that hideous funk! Our driver was waiting for us at the baggage carousel, and so were our bags. I guess when you are the last one off the plane, your bags have time to make it to the claim area. We warned the driver that I was sick and refrained from the usual handshakes and pleasantries. He got us to our destination swiftly and without commentary (except for the usual grumbling that experienced drivers do in a big city). 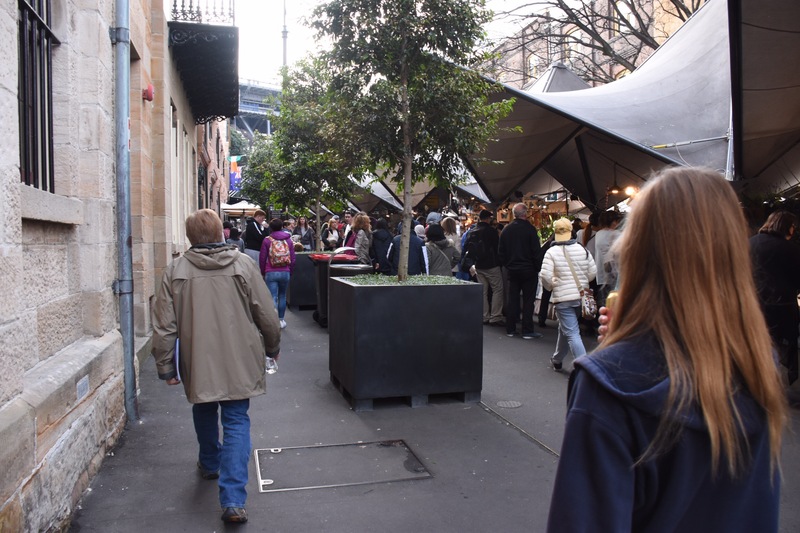 We were returning to Pier One in Sydney, the same hotel where we began our stay in Australia. I felt distinctly unhip this time. The glass of champagne they offered us upon arrival was unappetizing (so you know I was really sick!). We asked them to bring ginger ale to our room, and we went directly to our suite and called a doctor. How novel! They had a doctor on staff and for a price he would make a house call. While waiting for the doctor, I hosed myself off in the shower and bundled all my clothes into plastic. In 40 minutes, the doctor arrived, rolling medicine bag in tow, and checked us out. I didn’t have fever. The doctor told us that our symptoms were “suggestive of food poisoning” but he couldn’t be sure. Whatever it was, it was nasty. He dispensed a fistful of medicines for all of us, and Pier One added his bill to our tab. We felt pampered by Pier One. They knew how to take care of a sick person! They brought cold bottles of water and called to make sure we were okay. We knew we would be in no condition to tour tomorrow so with sadness we called to cancel our plans. 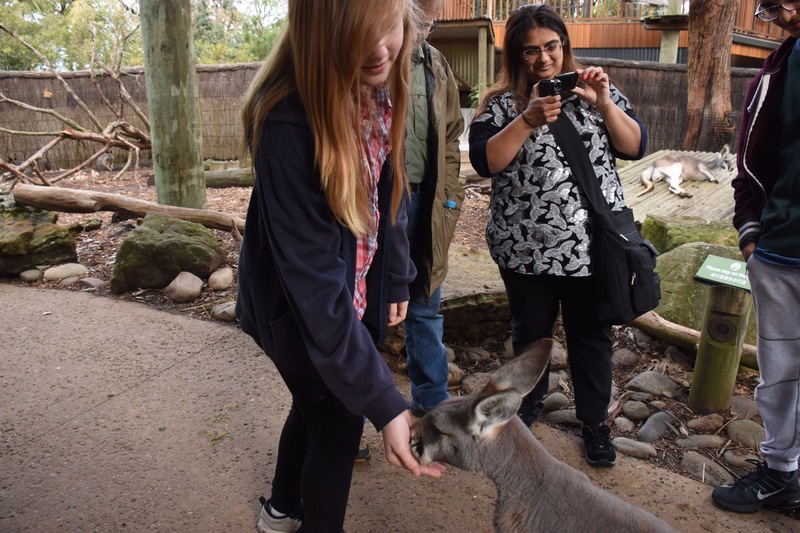 I was particularly let down, because the one thing I felt had been missing from our tour thus far was real and meaningful interaction with aboriginal people. Tomorrow’s tour called for a traditional aboriginal welcome in a sacred area in a national park. It was our last chance to learn more about their culture. When we phoned our guide to cancel, he tried to convince us to change our minds. This only made us feel lower because we really wanted to go. 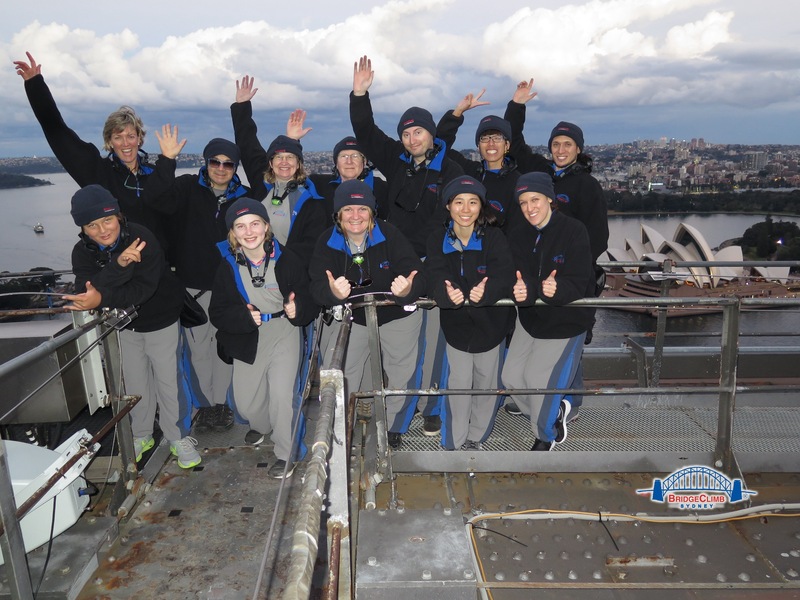 However, none of us could really be persuaded to wake up early after our death march across Australia. We took our medicines, turned off all the alarms, and went to bed.